Actually it was all a little more complex than that, and was due to this being the first time across the channel with this van – and it could all have been rather more traumatic. This van is the first we’ve had with a crash sensor for the gas system, which means that the gas valve on the bottle can be kept on. If we have a high-g accident the magic valve shuts off and we don’t explode. That’s the theory anyway. I’m not totally convinced that there isn’t a good chance of the gas hose being compromised in an accident, but anyway, I keep the gas on. This works well with the fridge, which is the first we’ve had with AES (automatic energy selection). This is a rather neat system where the fridge selects one of gas, 12V or 240V for operation, depending on what’s available. Gas is used when camping off-grid, 240V with a mains hook-up (or shore power as the Americans say) and 12V when we’re on the move and the engine is charging the batteries. So far, so good. But when you’re on a ferry the gas should be properly turned off – I’m sure a lot of people forget, but I’d hate to be responsible for sinking a ferry, particularly one I’m on, so it got turned off – more on that later. Once the gas is off, if you’re not on the move with the engine running, and don’t have a hook-up, the fridge has no options and will complain. So I turned the fridge off – and forgot to turn it on again. So, turning off the gas – not difficult, you’d think. We found our way to the right lane of the stacking area for the ferry, and I hopped out to open the gas bottle locker and turn off the gas. One of the catches on the locker wouldn’t open. Something inside the locker had moved and jammed it. That’s a bit of a Catch-22, since if you can’t open the locker you can’t move the thing that’s jamming the catch. 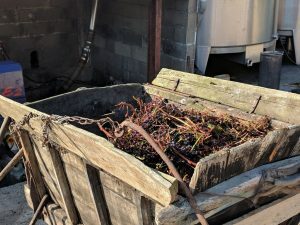 I was very lucky, because a bit of brute force and ignorance combined with long and relatively thin arms (lucky I don’t work on my upper body strength) meant I could force one side of the lid open far enough to get my arm in to move the contents. After a few performances of rolling on the floor with my arm deep inside the locker I got there, opened up, shut off the gas, shuffled the contents to avoid a repeat performance (I hope) and all in time to drive on. …apart from defrosting the fridge! 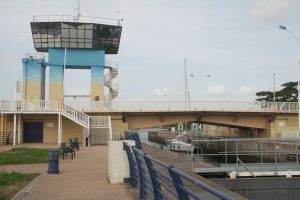 So we boarded the ferry in good time for fish and chips for lunch (the plan had been to eat in the van on the dockside while we waited for boarding), and then drove out through the always confusing ferry terminal and set off to do a few miles before our overnight stop. 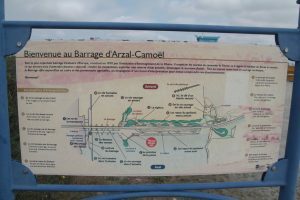 Recently we have used the aire de camping car at Stella Plage, near le Touquet, so that was where we were headed. Being earlier than expected we stopped off for a walk at Etaples – if we hadn’t done that plan A might have worked out, but when we got to Stella, the aire was full, apart from a couple of spaces on the end. After I’d carefully squeezed into one of those spaces, a man came ambling up and told me, in excellent English, that space had been vacant for a good reason because it was intended for cars only, not motorhomes – but if I just wanted somewhere to stay the night then there was a big space outside the church on Boulevard d’Angleterre (appropriately enough). And he was right. After a bit of shuffling around so that we were roughly horizontal and didn’t look too prominent we settled down and waited for people to complain. But this is France, and there were no complaints. Later that evening a French motorhome came along and parked back-to-back with us. After a walk to the sea front, and watching a glorious sunset on a warm evening, we had a really peaceful night, and didn’t wake up until 9:45. 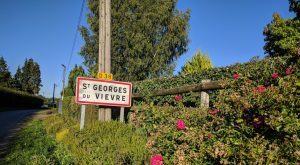 I had been agonising the night before about our destination for day 2, and we eventually settled on Saint-Georges-du-Vièvre – this is an unspectacular but charming small town in Normandy. We were doing a bit of a recce for a trip with our club next year, and this is one of our intended stops. 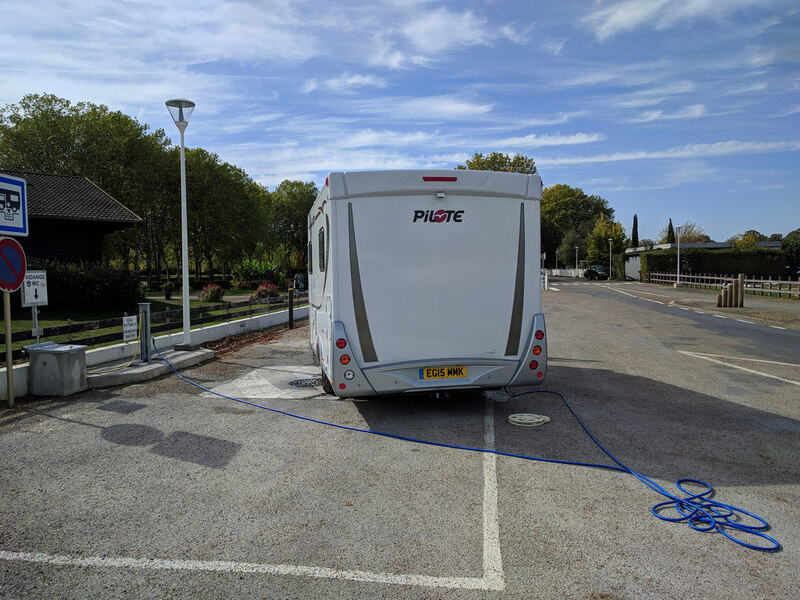 Apart from a couple of navigational mishaps near Rouen, one of which turned out to be self-curing, we were installed at the Camping Municipal in the early afternoon. Total bill for a decent site with electricity, including taxe de séjour – €11.40. 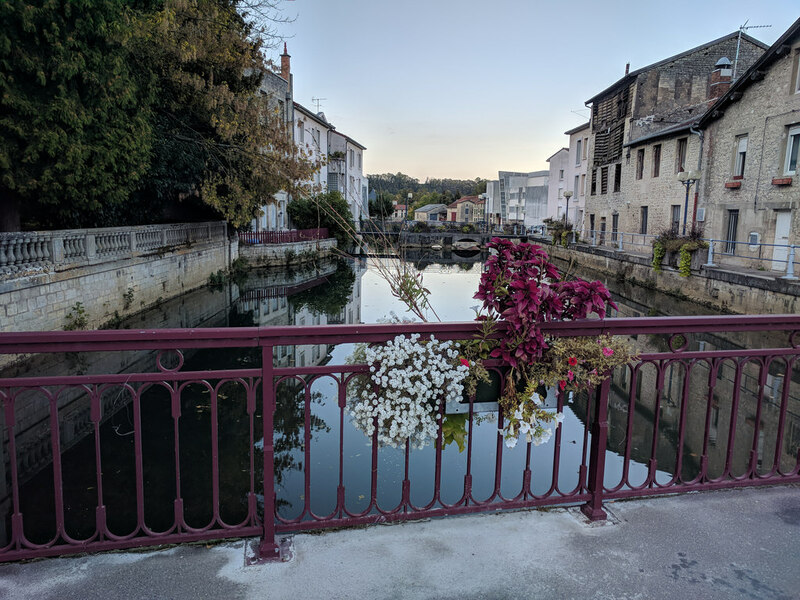 Plenty of time to chill in the warm sunshine, take a walk along the quiet lanes to Mont Rôti (which I would translate as Mount Roast Potato, but perhaps I’m wrong) and take a late evening stroll through the town. It was a good plan to let Mrs D test the site showers before I committed. They were apparently cold, so since we were hooked up to mains power for water heating, and we could top up water before we left, I took advantage of the on-board facilities – nice and warm! 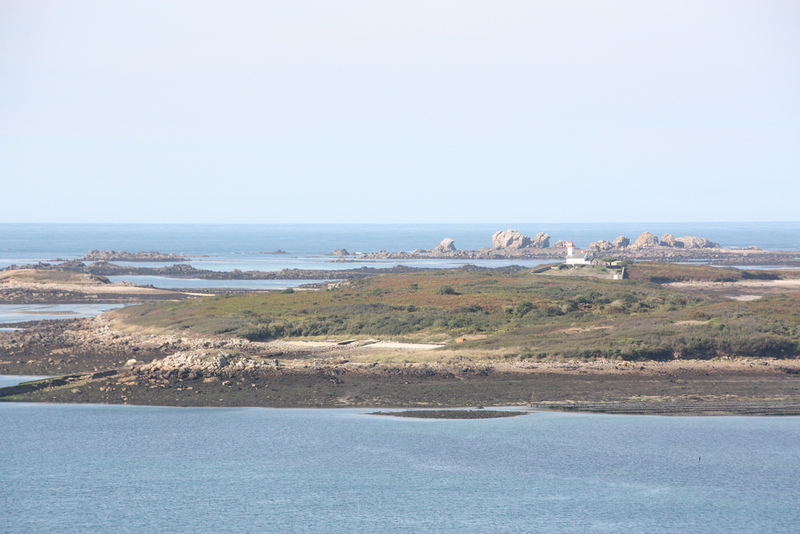 We had decided to move on to Cap Fréhel, at Camping du Pont de l’Etang. In the on line reviews one person described this site as anarchic – I can imagine that when it’s busy that could be a bad thing, but in mid-September anarchy means individual freedom. There are no marked pitches – you just pick a spot you fancy and pitch there – anarchy indeed. 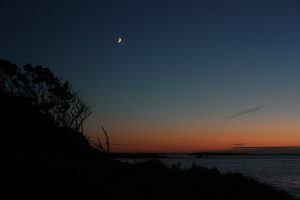 Total price for a night was €13.55 for pine forest and sand dunes with direct access to the beach without electricity. Not bad. 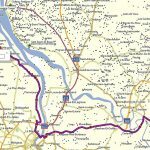 The 176 mile journey started and ended on small roads while 100 miles in the middle were on clear, fast and easy dual carriageway. Once pitched, Cap Fréhel was a brisk walk away and beckoned irresistibly – a lovely dose of fresh air and sea views after a drive. 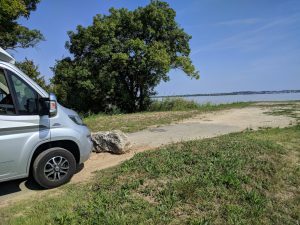 After taking advantage of the grey water emptying point at Camping du Pont de l’Etang we initially set off to see Cap Fréhel, but were put off by the small queue of cars waiting to pay to visit the car park. It wasn’t the queue that was off-putting so much as the thought of paying to park, especially since I had already walked there the previous evening – so we went right round the roundabout and headed off towards our next site. I was particularly keen to go l’Aber Wrac’h as I had previously visited by boat with my uncle and aunt in 1970. It had been a wonderful adventure and stayed fresh in my mind for nearly 50 years. There’s a Camping Municipal just down the road from l’Aber Wrac’h with access to lovely walking and cycling opportunities. After booking in for a single night and having a look around it wasn’t long before I went back to the office to extend our stay – “no problem, just pay when you go”. What a refreshingly trusting and laid-back approach. So we have a sea view on a spacious site for as long as we fancy. There’s a beach a few hundred yards away and magnificent views of the magnificent rocky coastline. Lovely – so lovely in fact that I was out enjoying the sunset and experimenting with my camera until it got dark. As I walked back to the campsite, a couple of French ladies in a very French white van asked me the way to the campsite. Easy in principle, except that we were on the road to the rear entrance to the site – the route to the main entrance is on a different road and had surprised me as we followed the signs on our approach earlier in the day. Trying to explain where it was, in the dark and partly in French was a fun challenge. We walked together through the campsite in the dark so that they could see where they wanted to go – I hope it helped. Of course, maybe they were just trying to pick me up! Earlier in the evening I’d taken the mountain bike out of the garage for the first time this trip and enjoyed a gentle ride to l’Aber Wrac’h port. 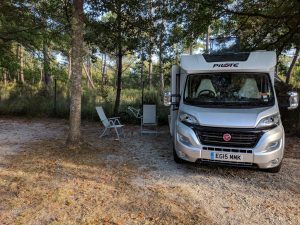 There were some motorhomes parked up for the night in the main car-park there – pleasant enough for a single night stay, but I’m pleased to be spending a few days where we are at the incredible price of €8.44 per night, without electricity. What’s not to like? Even the weather is behaving. 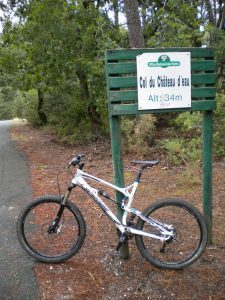 The first day without travelling, so the main event of the day was an exploratory run on the mountain bike. 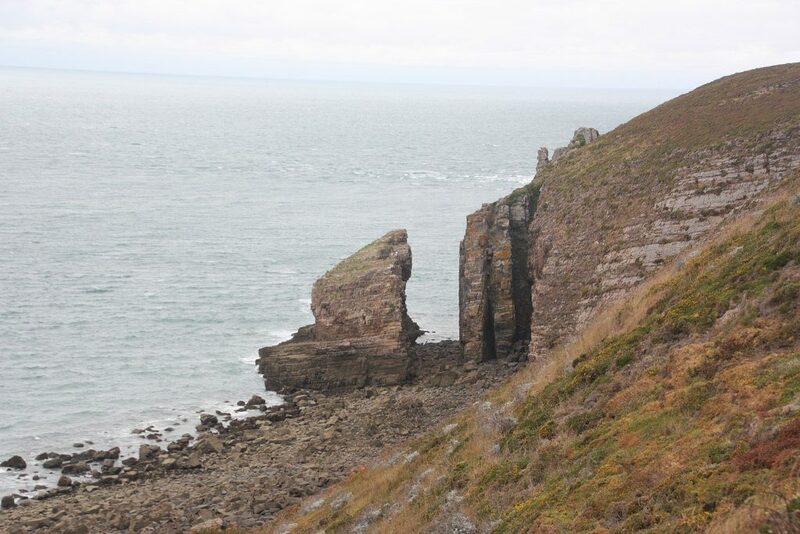 It took me from our campsite at the side of l’Aber Wrac’h to Saint-Pabu on the far side of the neighbouring aber, l’Aber Benoît. 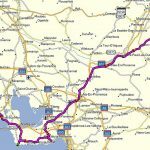 The round trip took four hours – mostly on very quiet country lanes and off-road tracks with just a couple of little spells on busier roads. All very civilised and clearly way-marked, although in the exhaustion-induced confusion towards the end I had a little navigational trauma. 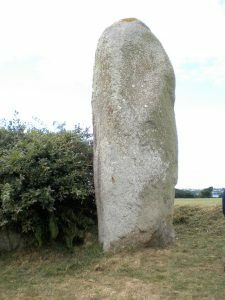 The trip was mostly peaceful countryside and views of the estuaries – oddly, at the side of a little road in the middle of nowhere there was a 6.5 metre high Neolithic standing stone, Menhir de Lannoulouarn. Why did they do it? In the morning we had indulged in a little table tennis. There wasn’t time for much else since we hadn’t woken up until nearly 10:00. Lunch was then a little late, since we got talking to our Dutch neighbours, and talked for rather a long time. After a ride that according to my Fitbit consumed nearly 2000 calories, dinner was much appreciated. Shopping has to be done, even on holiday, and today was a precautionary shop since tomorrow is Sunday. In France even big shops at best are only open till lunchtime on Sundays. And incidentally, on weekdays most of them shut for lunch. Very civilised, but a bit of a nuisance if you forget what day of the week it is. So groceries stocked up. Rather stupidly, since we had to drive straight past the filling station I didn’t check the fuel gauge before we left the supermarket. We might have enough for tomorrow, but I’ll try to find fuel tomorrow morning. 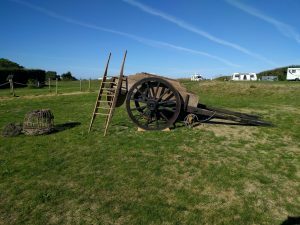 As it was the first time we’d moved the motorhome since coming to this site, we took advantage of the vehicle to go into l‘Aber Wrac’h, and walk up to the Sémaphore – a lookout and communications point built in 1861. 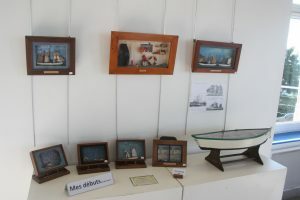 There was an exhibition of dioramas of local scenes in honour of the celebration of local history and culture taking place over the weekend, and as you might expect from a lookout point, a tremendous view. 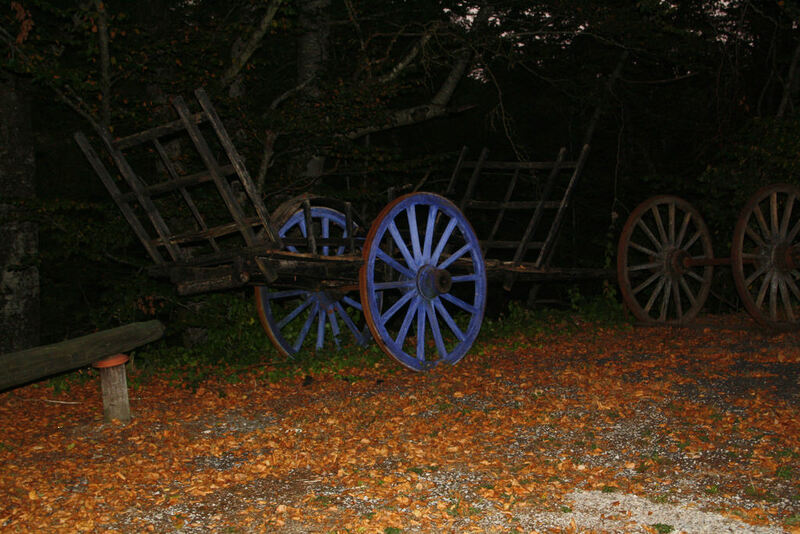 As a part of the celebrations in the area people were walking between various local landmarks to be greeted with food and refreshments – one of the feeding points was on our campsite, and an old cart and a barbecue arrived in the morning. It all seemed well supported and good fun. We’re now packed up ready to move on tomorrow to pastures new. Who knows where? 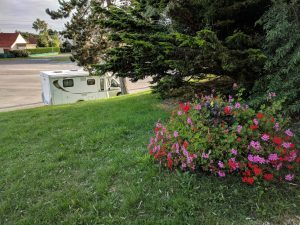 One week in and we’ve reached the one fixed point we had in the whole trip – Camping Municipal la Falaise in Locmariaquer. We’re here on a recce for a trip we’re planning with our motorhome club next year. This site is all about location. 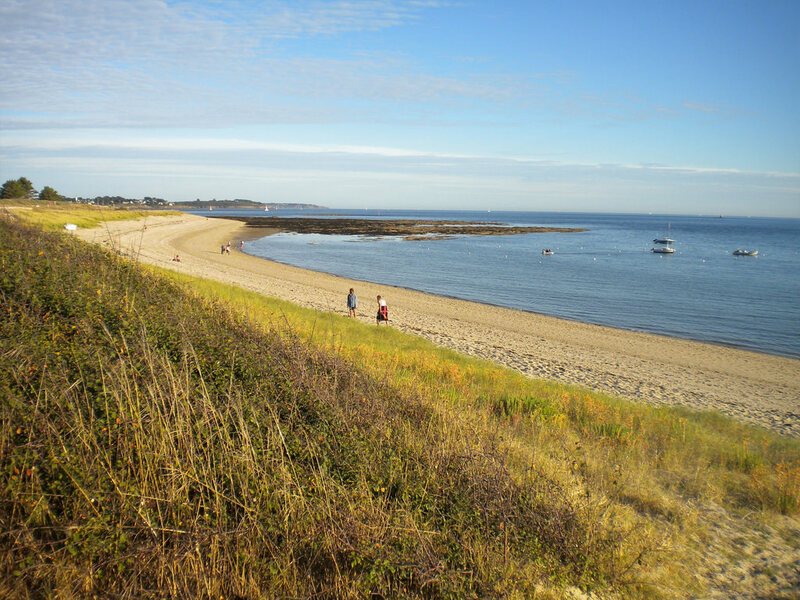 We’re literally fifty yards (or I guess metres) from the beach in the Golfe du Morbihan. There is everything here that we could need for a stay of a week or so, and once you’re installed on your pitch it’s a lot better than it looks at the entrance. 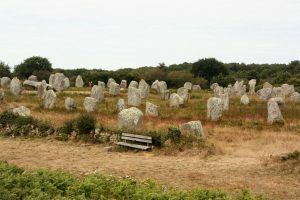 We stopped off at Carnac to get a sight of just a few of the thousands of standing stones in this area – again, why would you? 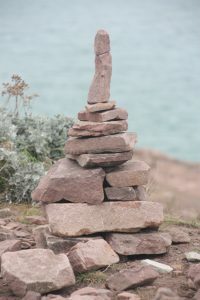 We agonised over whether we should spend €6.50 a head on a bus or petit train tour, but decided that once you’ve seen a few hundred stones, you’re sort of stoned out. So Carnac – tick in the box. We arrived at Locmariaquer (how on earth is it pronounced?) early enough for a little cycle exploration of the area. 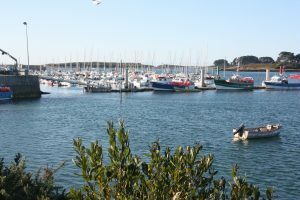 The port is particularly pleasant, with cafes and restaurants on the harbour-side, but the cycle rides in general aren’t a match for those on the north coast in the Abers. I always like a good pancake – but hey, we’re in France so I guess a crêpe will have to do, or maybe a galette. And very nice they were too, outside in the garden of the crêperie near the harbour in Locmariaquer. 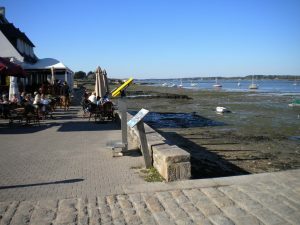 We had walked the coast path from the campsite into town – very cute. Our path back took us within 100m of the Mané de H’roeck, a large tumulus that I had met on my cycle ride the previous evening. This time, with my phone torch available, I was able to see what was beyond the little opening deep inside the mound – and the answer was a cool, dark little vault, located under this enormous mound of earth. There were a lot of busy people round here in Neolithic times. The sunny afternoon was an opportunity to jog some of the local paths, giving a good, if hot, 90 minute circuit along the coast past yet more sandy beaches. On my return there was just time to go for a swim, with the beach yards away from our camping pitch. It was sunny when I went in, but decidedly chilly when I emerged, having waded out a long way to find water deep enough for swimming. 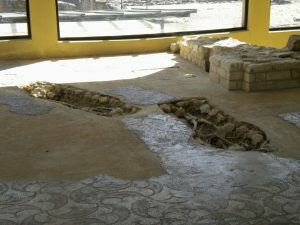 The site at Locmariaquer grew better with familiarity, although it would be very different at the height of the summer. The non gender-specificity of the facilities is particularly amusing – they are functionally divided instead, so whether you want the showers, WC or the rather jolly open-plan urinoir with saloon doors like in a cowboy film, you can use them regardless of your gender persuasion. That’s one solution to the modern gender fluidity problem. The destination here was very familiar to us. 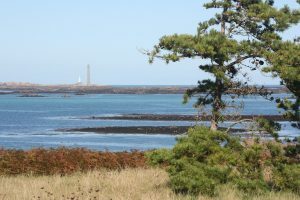 We were moving from Brittany to the Vendée. Notre-Dame-de-Monts has been one of our favoured destinations since those early family holidays in the VW camper. 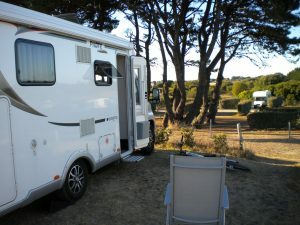 The aire de camping car (€8.00) was popular but not overflowing, and we found ourselves a perfect spot near one corner. The town was very end-of-season but the pizzas at the little restaurant we visited were very tasty and the welcome friendly. All very laid back. 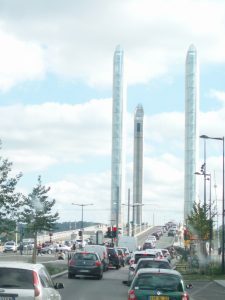 The journey here took us over the long and elegant bridge at St Nazaire – I don’t remember ever doing this before. The marais in this part of the Vendée is quite reminiscent of the Fens. We’ve been here many times before, and this is really a location for a sun, sea and sand family holiday, so the plan is to move on southwards tomorrow. 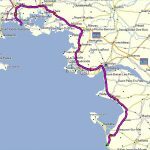 And travel southwards we did – 186 miles in all. We didn’t have a firm plan when we finally got going after a little food shopping in Notre-Dame-de-Monts. 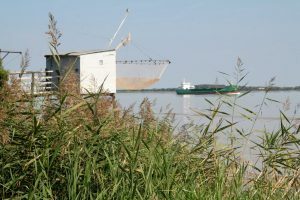 We are intending to visit Lac Hourtin in the Gironde, so I put that into the GPS and just let the journey take us where it would. At our lunch stop I pondered some of the options with maps, campsite guides and the internet (park4night is a useful app). 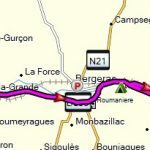 We could take the ferry from Royan – it’s a nice way to get over there, and it feels a bit of an adventure. But it looked as though the fare was going to be more than €45, and in a previous visit we had seen a German motorhome have trouble with grounding its rear on the loading ramp – we have a very long rear overhang and low ground clearance, so I was a little nervous about that prospect, and the €45 swung it for me. You can buy a lot of diesel for that and go the long way round. 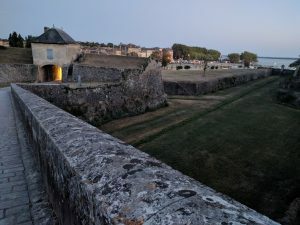 After considering travel times to various destinations, and reading a few reviews I decided that Blaye was a good target. There is a motorhome aire there right at the side of the river next to the Citadel. One review did suggest getting there early. In our case it was not quite early enough as we were beaten to the last available space by a French motorhome that had followed us in. 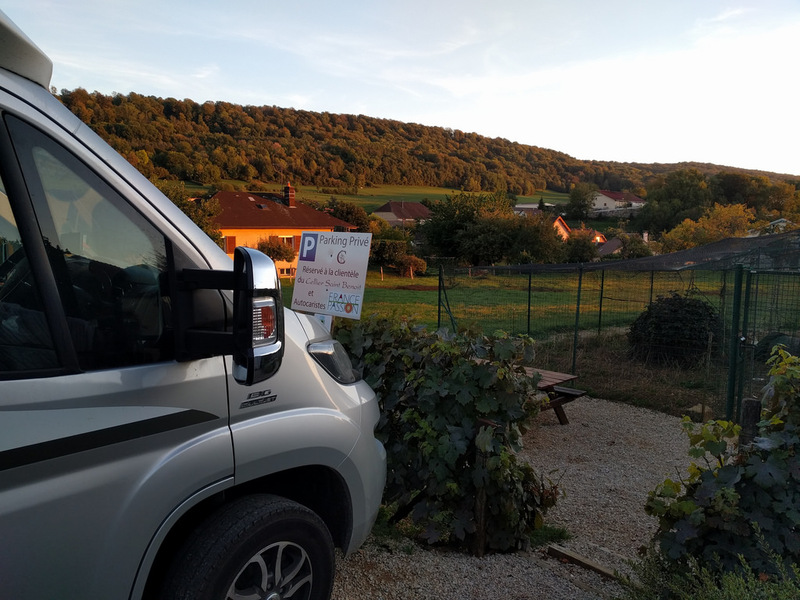 After practising a bit of Anglo-Saxon and consulting the guide books again we decided to head to a local vineyard which offers free overnight pitches as part of France Passion. Just up the road, all I had to do was to enter the coordinates into the GPS – so simple. I must have done something really bad in a previous life, because the GPS had decided to go on strike, and after being pretty well constantly connected all holiday my phone had no signal in the middle of a town. Doing it the old-fashioned way with a paper map wasn’t looking too promising either, so I was very relieved when the GPS spontaneously decided to sign on for duty again. 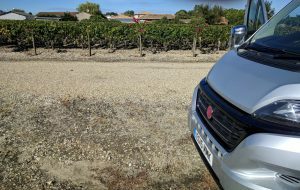 So here we are at Château Frédignac, one of just three vans in a little lawned area. 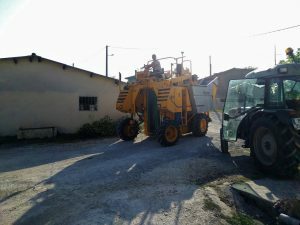 We have been warned that it might be a bit noisy at six in the morning, because they’re all off harvesting grapes, but you can scarcely complain about that if you’re parking for free in a vineyard. I walked the few minutes back into town to the take some pictures around the Citadel. 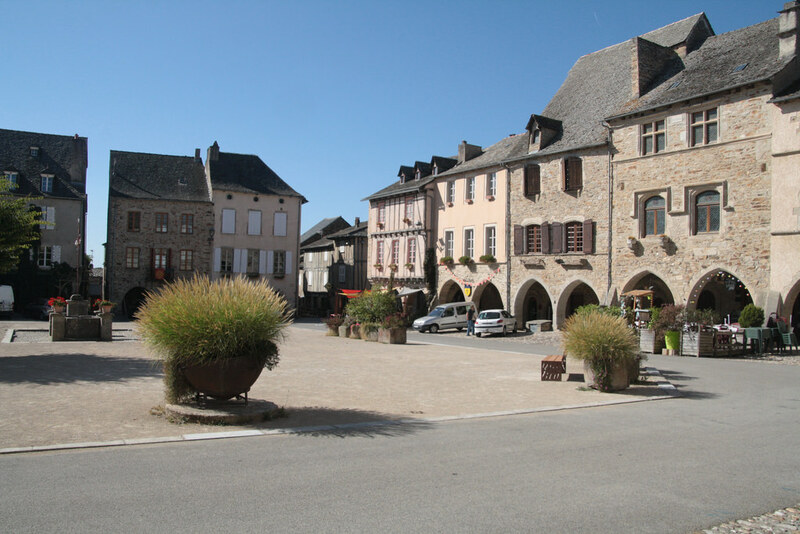 Here at the Château we’re just a little less conveniently located for town, but rather than being in a huge dusty car-park full of motorhomes, we’re in peace and quiet – till six in the morning! Not a bad outcome after all, so maybe the Almighty doesn’t dislike me too much. Sure thing, there was a bit of diesel engine activity in the early morning – sort of nice hearing other people work when you don’t have to. 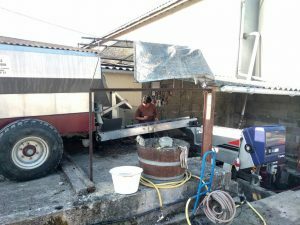 By the time we were up a whole lot of grapes had been harvested and we were able to watch them being unloaded, and then we were invited to a bit of wine tasting. It was rather early to be indulging heavily, and I was going to be driving. But we tasted enough to buy three bottles of red. 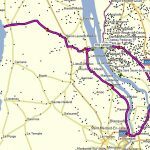 I had planned that we would lunch just 4km away, but it was the other side of the river, so getting there was considerably further, crossing some rather impressive bridges near Bordeaux. 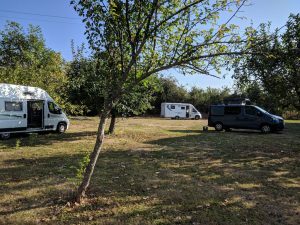 The target had been identified via the park4night app as a possible wild camping spot, and it would indeed be a lovely place to spend a night, right by the side of the river opposite Blaye. Today, it was a lovely place for lunch. From there it was but a short trip to Port Hourtin, a place we’ve visited many times over the years. In that time it’s evolved from a conventional campsite into a barrier-controlled motorhome aire costing €11.30 per night, with electricity. I had a feeling that coming here would be a disappointment, but the evolution has been successful, and we were able to select a pitch at the back of the site, with wild pine forest behind. There are enough people around for it not to feel abandoned, but it’s far from full, so plenty of space to relax. 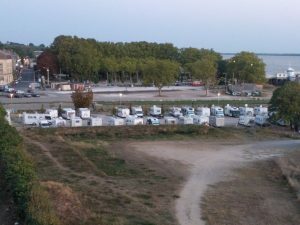 Aires tend to be either like a glorified car-park, with motorhomes parked in closely packed ranks – the one in Blaye that we didn’t get into last night was one of those. Or they can be more like a campsite, as this one at Hourtin, with reasonably spaced pitches under shady trees. It’s warm enough here that shady is good. 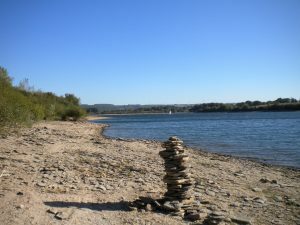 The lake with its sandy beach is just a couple of hundred yards away, while the town of Hourtin is about a mile down the road. 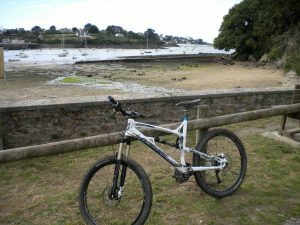 On this our first evening I took the mountain bike for a ride to Hourtin Plage, which is on the sea about 15 km away. There is hard-surfaced off-road riding the whole way. The beach is soft sand and extends quite literally as far as the eye can see in both directions. The size of the waves was enough to convince me that a swim in the lake would be a more restful experience, which is just as well because there were too many people around for any thoughts of skinny-dipping – the world has been saved from a traumatic experience. Rain – that was a bit of a shock, and it wasn’t very warm either. That’s not supposed to happen here, but the wet morning gave way to an OK (but still not exactly hot) afternoon. We had walked the mile or so into Hourtin town in the rain this morning to pick up bread supplies – fortunately the bread shop is also a patisserie so we could buy some lovely sweet French things for our dessert. It made a walk in the rain almost worthwhile. The rain water soon evaporated, so my afternoon mountain bike ride was not as unpleasant as it normally is on wet roads. 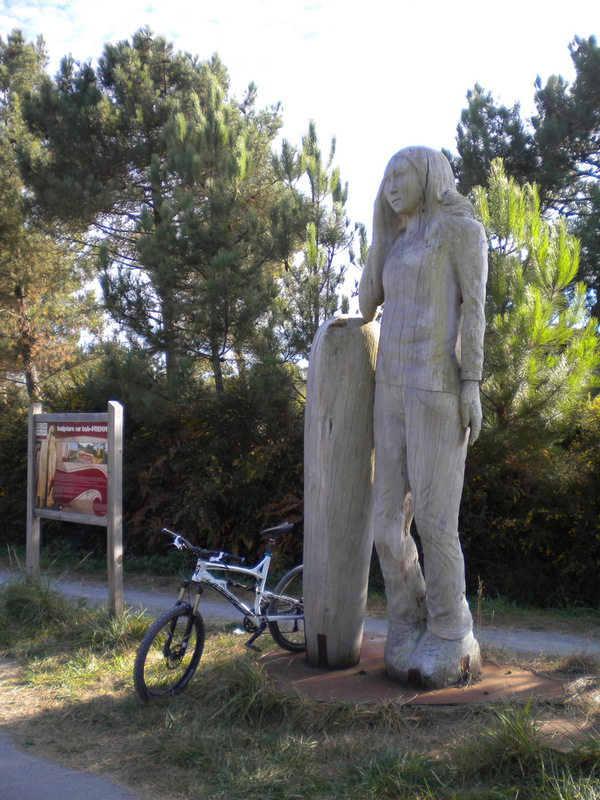 I had seen some way marked off-road rides signposted from the cycle way to Hourtin Plage, so they had to be explored. The first couple took me off the path for about 10 minutes and led me back a little further on – nice little rides through the forest, all quite sane. I had realised after I had started out that I’d forgotten my helmet, so the intention was not to do anything too crazy. 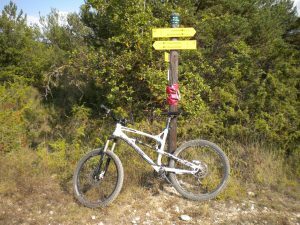 Then came the next VTT route – again it was beautifully way marked, so I expected another quick diversion off the path and back again. It went on and on – at one time I wondered if I was accidentally going in circles, but it seemed not. Where the initial warm-up routes had been pretty gentle, this route included some precipitous descents and big drop-offs – certainly, given the lack of helmet enough to make me take the sensible option and attempt to stay alive. This seemed quite important at this time, because I hadn’t seen a single other person on this off-road route. It’s interesting to reflect that forgetting my helmet probably made the ride safer than if I’d been properly equipped, in which case I might have made more foolhardy decisions and fallen off. I’ve only ever fallen off my bike while wearing a helmet. As I followed the way marks on and on, I began to realise that I was wrong in my assumption that this was going to be a tame little ride. I also realised that while the ride was excellently way marked I had not the slightest idea of its destination. The tame little ride would take me back to somewhere near its start, but this clearly wasn’t going to do that. Google maps to the rescue – while I had forgotten my helmet, at least I’d had the sense to remember my phone. I wasn’t a disastrous distance from our campsite – but it was still not clear where this meandering path would take me. As I considered my options there appeared as if by a miracle another bike rider. He looked fast, and he hadn’t forgotten his helmet. He looked at me a little worried – how had this old guy found his way to this remote point. I told him where I was trying to get to and his reply was that while anything is possible, I was the wrong side of the lake, and the marked route was going to take me even more wrong. It would be much easier not to follow the way marks but to bale and take the big wide forest track back to civilisation – unless of course I really enjoyed the single track. 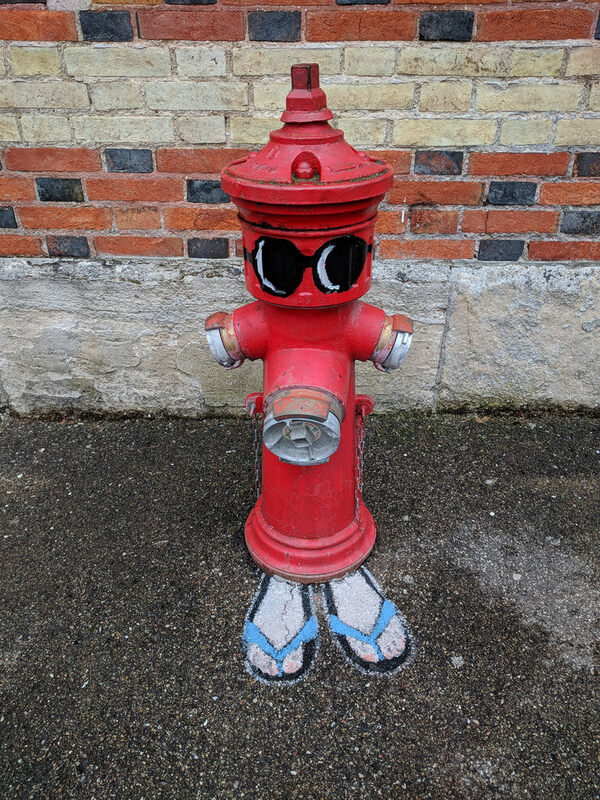 He gave me another worried look. I’m not normally one to give up on an objective, but since I still had no idea where that track would eventually take me, I decided that the prudent thing was to bale. Up the forest track, so much faster than the challenging single track in the forest that I had been in for so long – I was soon back to places I recognised. Instead of heading straight back to the motorhome, I turned the other way and went to Houtin Plage, which takes me back to note 2 above. There was a big map showing the VTT routes, and the one I was following would, in due course, have brought me back. As I said to another cyclist who came over to check I was OK, it would have been so much better if I’d looked at the map before I’d started. 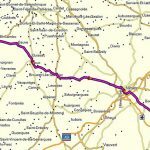 Just a gentle little 20 mile backtrack to the Gironde river, very near to where we had lunch a couple of days ago. The aire at Hourtin gave us a full 48 hours rather than having to check out at noon as with a conventional campsite, so in the morning we took a walk to the end of the pier and watched the serenity of the lake and then after lunch took advantage of the aire’s facilities to dump our grey and black water and take on a tank full of fresh water, ready for another few days off grid. Hourtin was worth a visit, despite having been there so often in the past, and the aire makes for very easy living at a good price. We also needed to top up on shopping, especially with Sunday coming soon, so we made a stop at Carrefour Connect in Hourtin town to pick up some stuff – all important stuff I’m sure, but the only notable items I remember are from the patisserie counter. Those citron tartlets were very tasty. 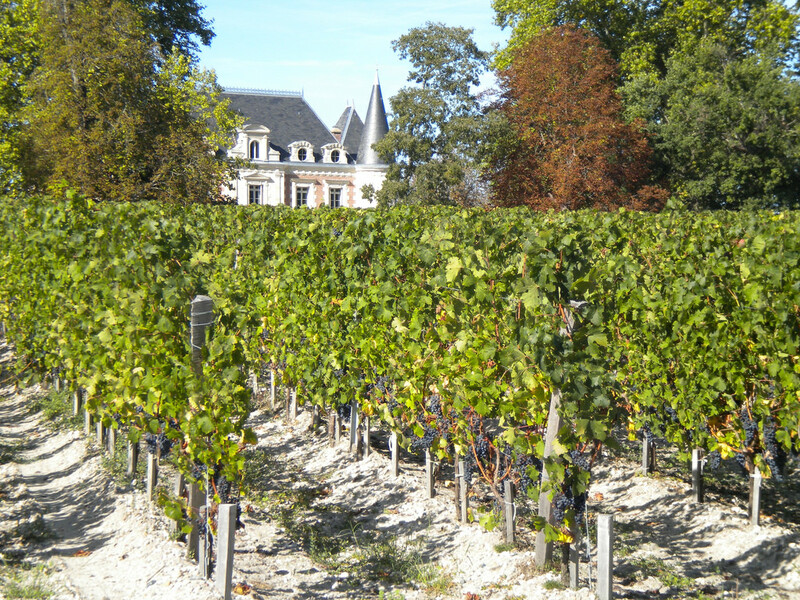 We’re now at Château du Moulin Rouge, a quiet little vineyard in Cussac Fort Médoc. Unlike our stop the other side of the river, they haven’t started their harvest yet. 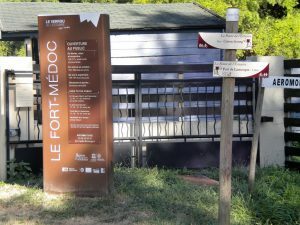 Mrs D and I went out for a walk, and I continued to Fort Médoc itself when Mrs D turned back defeated by the heat. Turns out they wanted money for me to look around, and that wouldn’t make sense alone, so I turned around clutching a leaflet – perhaps tomorrow. 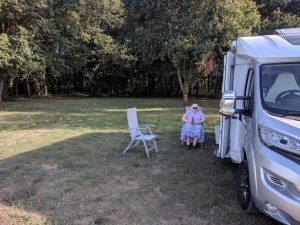 I always like to please a lady, so it was good to arrive at Fort Médoc in the motorhome to see the same enthusiastic lady at the gate. 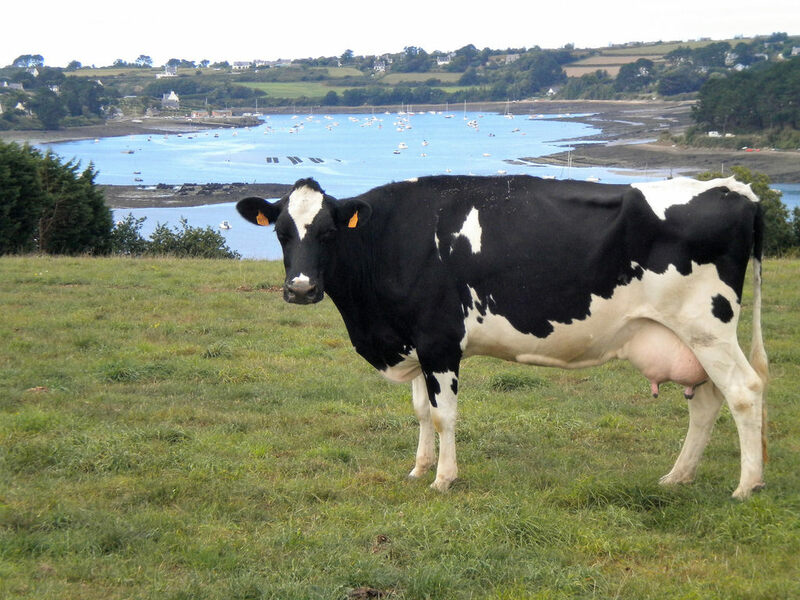 She had convinced me it was worth coming back – and indeed it was worth the trip. Although heavily restored (indeed rebuilt might be a better word) the spacious fort was interesting and impressive. I’ve never before thought of the challenges of building a fort on sand in water meadows. Some good innovative engineering went into the design, and a lot of work has taken place in recent years to make it a nice place to be. For lunch we returned to the picnic site by the river that we had visited a few days earlier – peaceful and shaded with a lovely view. We then set off on the day’s travel. 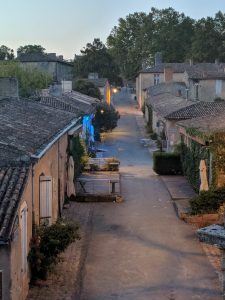 There was really no particular destination for the day – I had set Bergerac as a waypoint and we would make our decisions when we got there. So the plan was no plan, and even that didn’t get executed. It all went a little wrong in Bordeaux. (It’s only just struck me that the name Bordeaux, which for me has a hint of romance, simply means the “edge of the waters”). The bridge on the big fast road was shut. There was no real warning of this – just a barrier on the slip-road that put me in a slightly dodgy place on the dual carriageway. Assuming that it was just the slip-road that was closed I followed the detour signs to do a U-turn and approach from the other side – yet another awkward barrier. The bridge was shut. I found a convenient side street in which to stop and have a deep and meaningful conversation with Samantha, the lady inside the GPS, and we (Samantha and I) set about reaching the next bridge, which we successfully achieved, albeit through very heavy traffic. We then got a little confused in an area Samantha didn’t know too well. This involved us doing a couple of laps of a very tight residential area before we could find the right escape route. 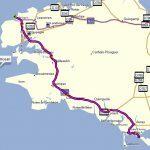 So all was well, apart from the fact that after the general confusion and traffic jams we were rather later than intended – not disastrously late, but we would have to decide where to spend the night. 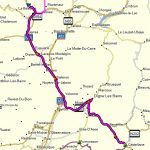 But France it’s motorhome heaven, and as we passed through a village called Saint-Pey-d’Armens there were signs suggesting a motorhomes welcome stopping point – and so it turned out as we entered Château Gerbaud. I stopped to take a look at the very closed reception area and an old guy (even older than me) with a very high-pitched voice indicated that I should just go in and park. I’m still not entirely sure whether it’s free or €5 (I don’t think libre means the same as gratuite), but either way it’s a nice place to be, parked up with vines in front and woods behind. So very civilised. 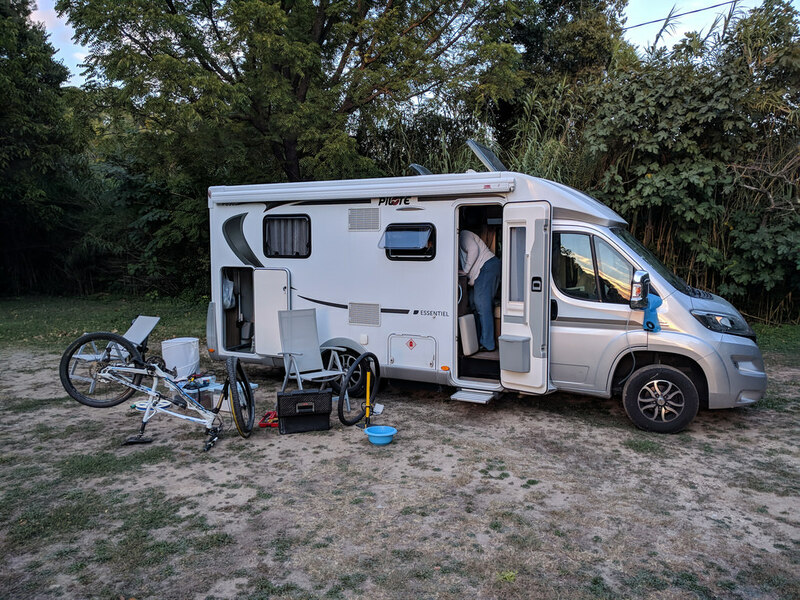 I had time for a bike ride down to the Dordogne river, pedalling through Sainte-Terre, a cute little town such as we no longer have in the UK – thank heavens for Google Maps, otherwise I would still be trying to find where we were camped. Now to start on plans for tomorrow. Did a lot of stuff today – feeling like a proper tourist. Started off with the boy’s housekeeping jobs, filling and emptying various types of “water” as appropriate. Basically a motorhome is a machine for turning nice clean fresh water into something less pleasant. Actually, I guess it’s humans that do that, while the motorhome is just a vehicle for those substances. Then off to the Château office to see what was required for our stay. It seems that buying half a dozen bottles of red will suffice. 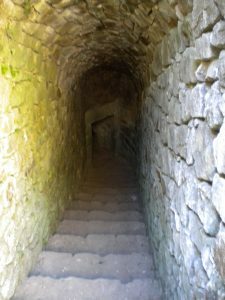 So then we set off towards the east, before I decided to follow a sign for Gallo-Roman remains, and we were soon looking around the site of a Roman villa in the village of Montcaret – very interesting visit, and probably not a bad villa in its day. 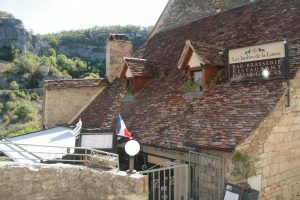 We stopped for lunch in a car park in the little town of Creysse, still just a few steps from the Dordogne. As I often do at lunchtime, I took a look at Google Maps to see what was around, and was fascinated to see that there was a fish lift at an EDF hydro plant just a few miles away near Tuilières. A fish lift just had to be done. How do they push the buttons? Do they swim clear of the doors? Sadly I didn’t find out. After a slight navigational problem (being on the wrong side of the river) we found the location, but it wasn’t open on the day we were passing. Considering the maps and guides the previous night I had thought that La Roque-Gageac looked interesting so we continued along the river in that direction. Actually, more accurately, we continued along the road with the river nearby. After a bit of trauma trying to get into an Aire de Camping Car on the ourskirts (I had a subscribed for this particular brand of aire, but we didn’t have the right card with us) we continued into the town and found ourselves in a municipal aire that was cheaper and better located, if a little snug. It certainly wouldn’t pass the Caravan Club 6-metre rule – we’re probably less than a metre apart. 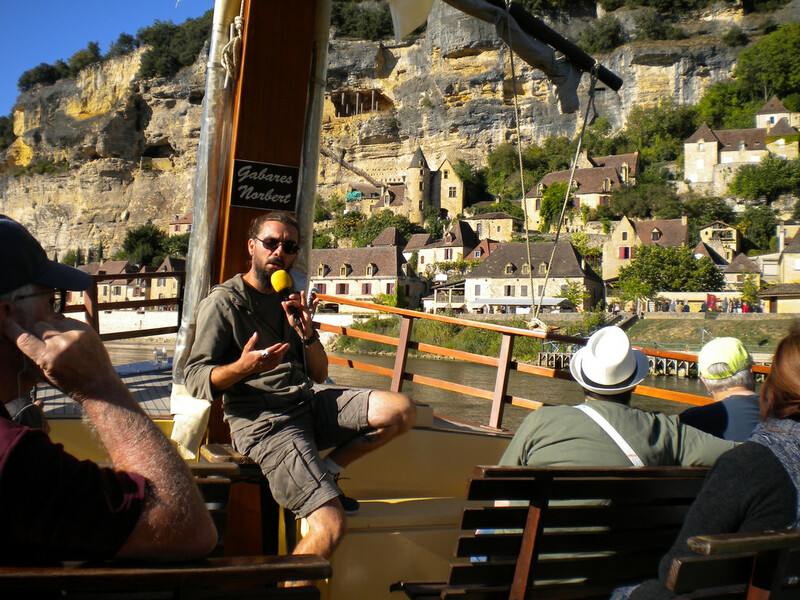 But what an opportunity to be like real oldie tourists and have a little boat tour. Very nice too. It turned out to be another day of touristy things. 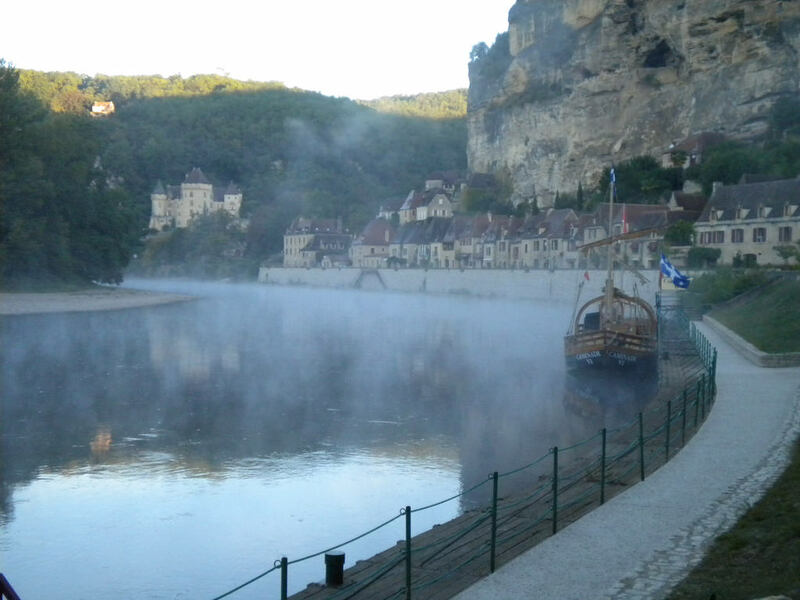 We got off to an early start because the parking for the aire in La Roque-Gageac was only valid until 8:00am – at least that’s what the ticket said. The notice near the ticket machine had some hand-written notes stuck to it suggesting the validity was actually 10:00am. Perhaps I’m too used to the villainous parking enforcement companies in the UK, but I worked on the basis that the ticket was right and set the alarm for 7:30 – not good when you’ve been naturally waking up after 9:00. So off we went shopping. I’ve never understood Mrs D’s shopping strategy. We have a note of what we want and walk round the shop looking at things that are not on the list. That wasn’t too bad as we went through the skimpy underwear department, but strangely that didn’t seem to interest Mrs D as much as it did me. Anyway, essential patisserie loaded up (and I believe a few other things), we could set off on the day’s business. 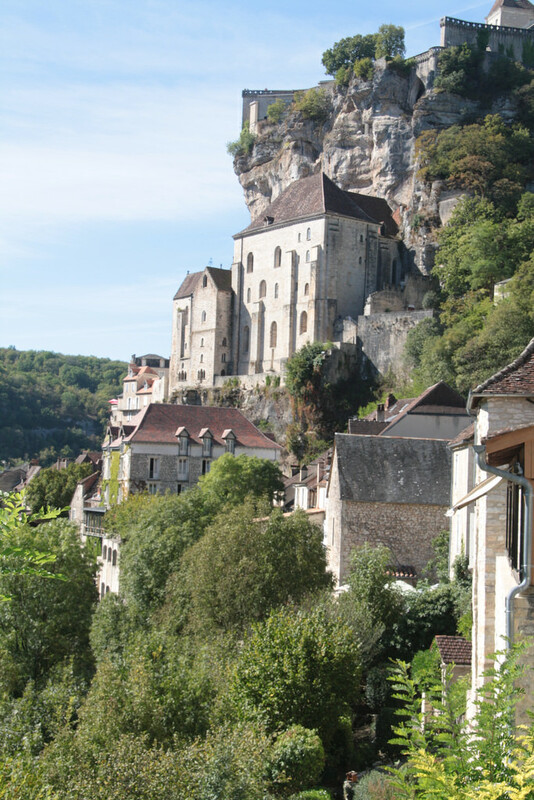 GPS set for Rocamadour – it had to be done. I’d seen the pictures and it was only just down the road. Although I’d done a bit of homework I didn’t have a plan for where we were going to park the motorhome. The requirements were quite demanding: enough space for a motorhome, close enough to the town that Mrs D could get there, and preferably free – all of this in a tourist honey-pot. After travelling some narrow roads we arrived, and I put myself in the hands of the almighty in terms of final approach. A sign on one road suggested that it would be unwise with a motorhome, so by a process of elimination we were headed towards the castle. Amazingly there was an enormous flat area with a whole bunch of motorhhomes parked up, it was free and it was just round the corner from a lift which would help Mrs D with the lengthy staircases. The town was only a couple of hundred yards away horizontally, but it was about the same vertically as well. 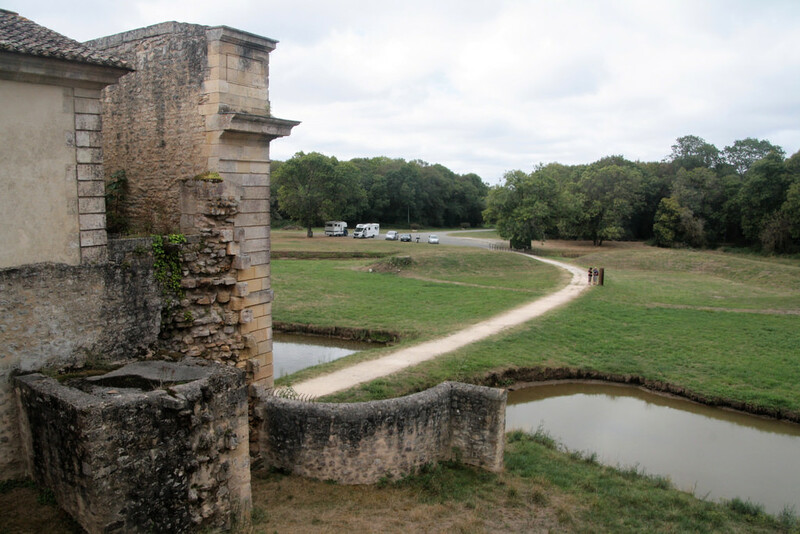 The journey took us through the Sanctaires, which were visited by pilgrims in centuries past. They didn’t have the benefit of the lift to get them up from the valley, but it struck me that being a tourist today is much like being a pilgrim all those years ago. I’m sure the pilgrims were ripped off by the hustle of both traders and religion. Nowadays we have the traders and the enforcement authorities. Why would you go to Rocamadour to buy a dress or a thermometer? I wouldn’t, but should you want to, they’re there. Putting the touristy hustle aside, the old town was lovely, and the architecture built into the cliffs is something to behold. As an engineer I just wonder how it’s possible to deliver modern-day services to buildings in such a place. Where do you bury your broadband or your sewers? We took lunch at a little restaurant on the outskirts – somehow the atmosphere there was more peaceful than the hubbub in the centre. 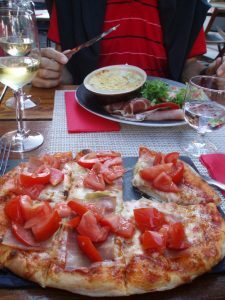 Like most of our experience of eating in France over the years, the food was well cooked and well presented by friendly staff. Eating is generally a good experience here. In an exploration of the castle area before leaving I discovered the ramparts, and we took the short walk there to get an incredible view over the city – it’s a shame the turn-style robbed me of a couple of Euros, but the rampart visit was still well worth it. I hope I’ll get my reward in heaven. We still hadn’t selected a destination for an overnight stop. We could have stayed right where we were, and had it been later in the day that would have been a perfectly reasonable solution, but we decided to move on further east in seeing parts of France we haven’t seen before – as I write this we’re parked up in the countryside not far from Rodez at a France Passion location, listening to the owls. All being well, tomorrow is another day! challenging because it’s on a slope, so a single continuous moat won’t do the job. 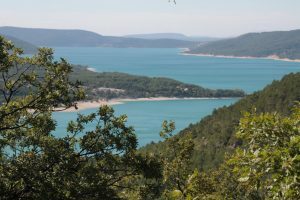 Having had a relaxed wander, we set off for the short hop to our intended destination on Lac de Pareloup. We stopped off on the way at Saint-Georges-de-Camboulas. It’s one of those places you’d never plan to go to – a fortified church down a dead-end in the middle of nowhere, but as well as providing a lovely location for lunch, the church is an amazing construction. It appears to be used nowadays as a location for scout and guide camps, but was totally deserted for our visit. 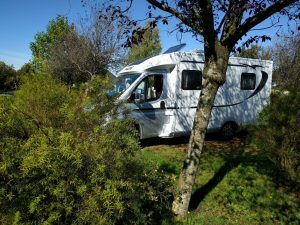 We arrived at the motorhome aire in Salles-Curan a short time after our lunch stop. It used to be a campsite, but is now purely for motorhomes, with a card machine at the entrance which takes your €11.00 per day. 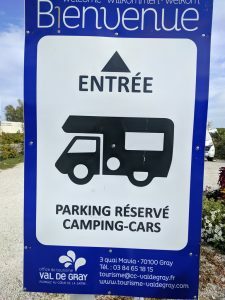 This is excellent value for a spacious pitch, full motorhome services and a facilities block which seems to be limited to ladies only – although I guess, this being France, it’s OK if men wander in too. I’ve never heard of Lac de Pareloup. 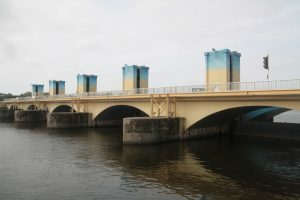 It seems it’s a reservoir used primarily for hydro-electric power generation, but also for drinking water, not to mention boating, kite surfing and other such activities. 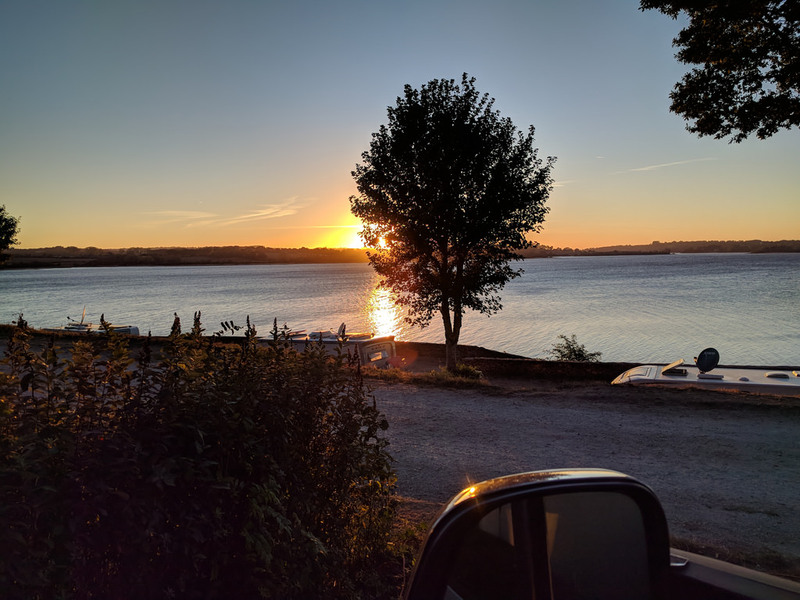 Our pitch, in a slightly elevated position facing west over the lake gave us an absolutely fabulous sunset view, which must count as one of the best we’ve had from a campsite. I took the opportunity before dinner for a couple of hours exploring on my bike, which took me around the lake, partly on road but also on tracks and paths. For once it didn’t involve losing my way, and Google Maps was not required – I guess with a large body of water as a landmark it would be pretty difficult to get lost, even for me. Note to self: if you’re going to run into a wooden post in a car park, make sure you hit it with the ball-hitch. That was a good shot! But it was slightly disturbing that neither the reversing sensors nor I, staring at the reversing camera actually saw the post. No harm done to van or post. 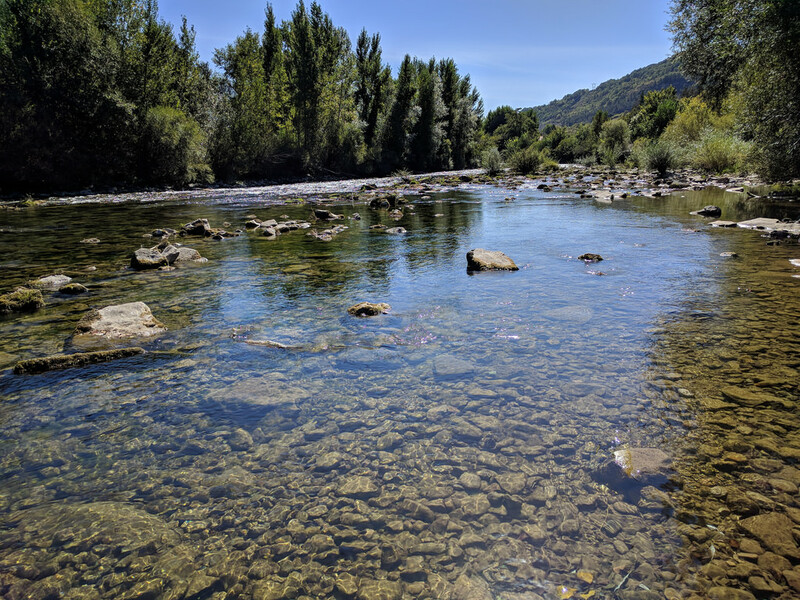 Last night’s parking location was going to be difficult to beat, and tonight’s certainly doesn’t, but it’s a competent enough aire de camping car opposite a picnic spot beside a little river in the Cévennes. If you were doing a walking holiday there are probably some good options from here. Before leaving this morning we made good use of the electricity and water available at the Lac Pareloup stop to use the van shower and empty and fill our water of various flavours. As it happens, all the water stuff could have been done at tonight’s stop too, but we’d have been using our own gas for hot water rather than site electricity – but at €2.00 per night, who’s complaining? 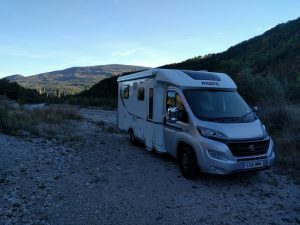 This trip we’re exploring some of the parts of France we haven’t seen before, so we decided to come through the Gorges de la Jonte rather than the better known Tarn Gorges, and we then turned south through the Cévennes National Park. Although it was only a short trip in terms of distance, much of the route was twisty mountain road, with some climbs and remarkably long descents. The views were the sort that you need to be there to truly appreciate. Certainly my photographic skills can’t capture the magnificence of this sort of country – row upon row of hills and small mountains stretching into the distance towards the Mediterranean, vultures flying high above the natural rock formations and the forest below. And it’s not crawling with tourists, which on these roads with a wide motorhome is certainly helpful. A lovely sunny morning greeted us in our aire near Bréau after what Mrs D told me was a chilly night. This was followed by a very cheery gentleman who came to collect his €2.00. He told us that we could get bread and sweet onions in the village – as it happens I later bought bread and pain au chocolat. 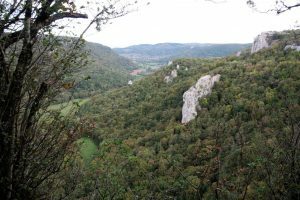 We also had a wide-ranging discussion about religious persecution, the topology of the area (the Causses are particularly special) and he recommended visiting the Cirque de Navacelles. Samantha (the lady inside my GPS) had also recommended the same, so I was pretty convinced that trip had to happen. 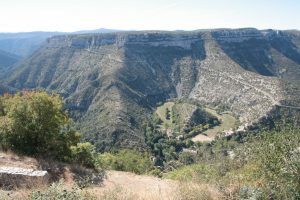 The Cirque de Navacelles, or more particularly the view of it from near Blandas, is like a mini Grand Canyon, made all the better by the fact that you don’t have to go to America to see it. 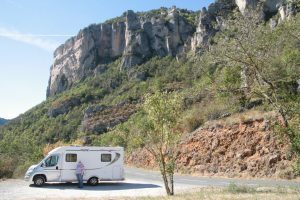 The viewpoints are very easy to get to, and the access and parking are motorhome friendly. 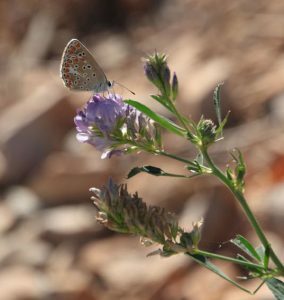 If you’re anywhere in the region, go to the Cirque de Navacelles. 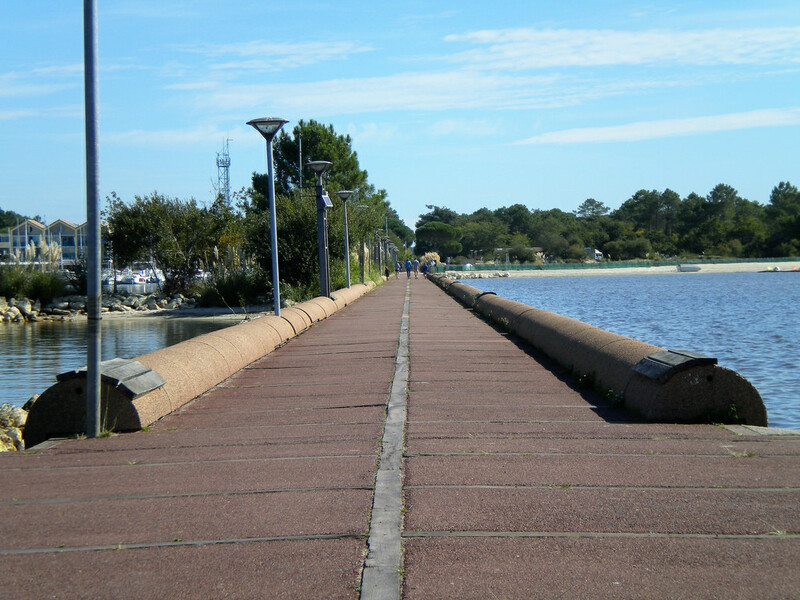 For the rest of the day I had been torn between a revisit to Vias, near Agde, where we stayed a few years ago, or exploring new places. 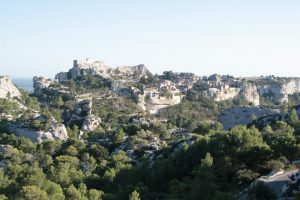 An article in Le Monde du Camping Car, our favourite French magazine suggested that Les Baux-de-Provence was an interesting prospect, so after admiring the view at Navacelles we set off towards Les Baux. The magazine article suggested that there were events in the town related to Picasso and some of his associates – that would be fun. I hoped that our luck would hold and we would just turn up and find somewhere convenient to park the van. 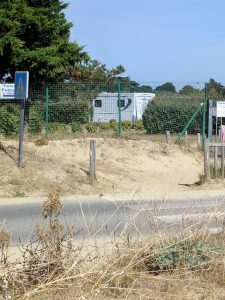 I tried, but it proved to be the most motorhome unfriendly place we have visited this year, despite being recommended in a motorhome magazine. 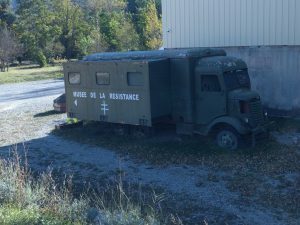 From what we could see on the move it is indeed an interesting place, but after several abortive attempts to park, either to visit the town or stay overnight, I gave up and we’re now parked at Mas Carlin, a farm a few miles away. We’ve tasted their wines and jams, and bought a few of both. It’s warm and quiet and friendly. This turned into a bit of a travelling day. 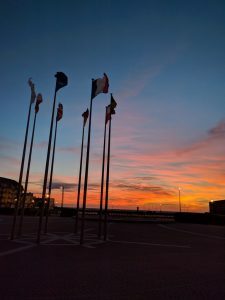 It was never meant to be that way – the plan was for a short drive down to the Mediterranean at Carro (not far from Marseille), park up at the aire on the harbour-side and wander in the sunshine. A stop at a supermarket would be in order, to make sure we survive Sunday. It mostly went to plan (suitable patisserie acquired), but it turned out a lot of other people had a similar idea, and the car-park like aire at Carro was full. The drive down took us through some pretty heavy-duty industrial areas, but Carro was pleasant enough, as far as we could tell in our brief visit. With half the number of people we would have enjoyed a night stop and a wander around the resort. 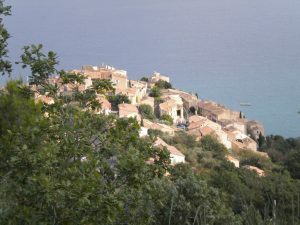 To make sure we didn’t miss out on a potential gem of a holiday area, we trundled further along the coast, getting ever closer to Marseille but as we saw the parked cars packed in at the roadside on the hill down into Niolon we knew it was never going to work. I guess this wasn’t the sort of place to come on a sunny Saturday. Despite the narrow road and hoards of people we were able to do a neat turn in a car-park, and found ourselves a quiet spot to think again – there had always been the bare bones of a plan B, and now was the time to make it happen. 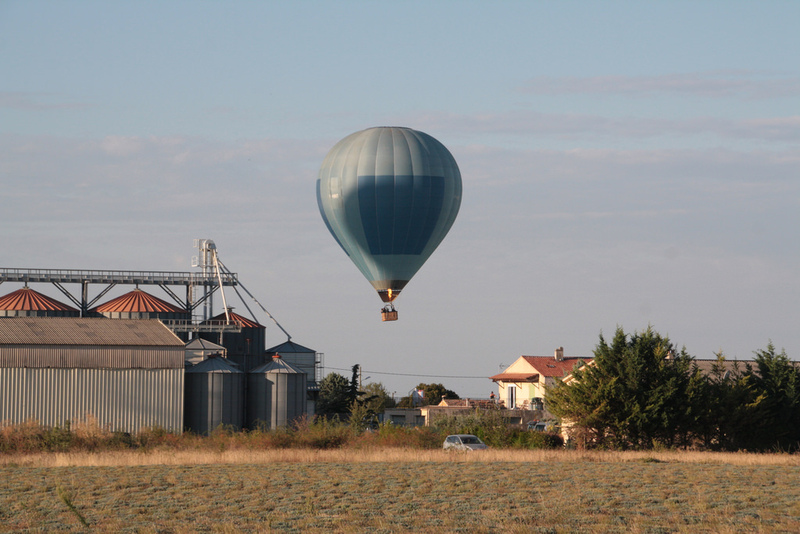 The inspiration again came from an article in Le Monde du Camping Car – Provence. It wasn’t too far and we should get away from the pressures of the sunny Med. And so it has turned out. We found the campsite-style aire in a little town called Puimoisson. 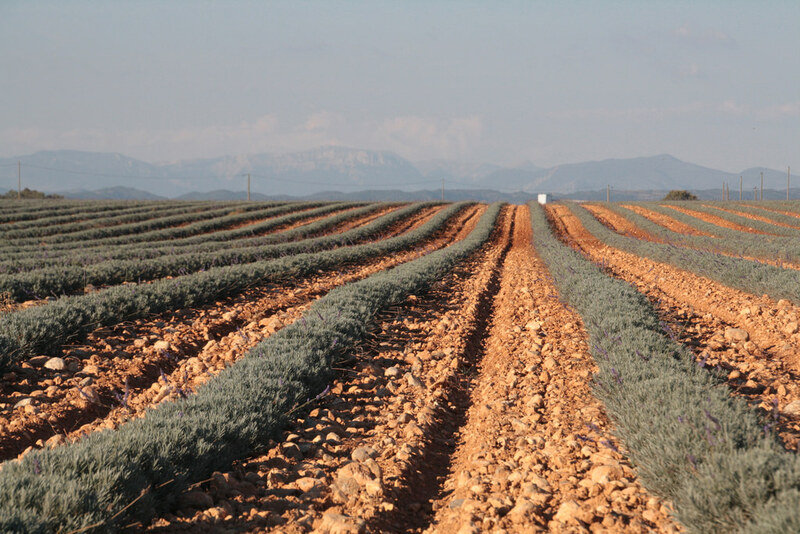 We’re parked within easy walking distance of the town, alongside a field of lavender with a view of mountains to the east – time for a bit of relaxation I think. 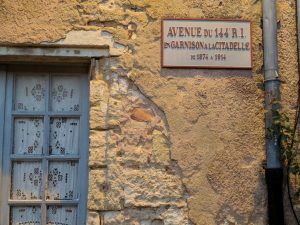 On this trip we are exploring some of the places we haven’t been, rather than sticking to the comfort-zone of what we know, and that approach serves not only to discover places you’d like to see more of, but also to identify those you’d never bother to go to again – and the bit of coast to the west of Marseille is now firmly classified into the latter category. 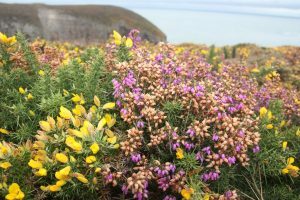 On the basis of this experience, and careful consideration of the map, I don’t think we’re ever again likely to come this far round the coast – it’s all too developed and exploited for us. 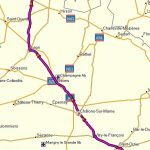 The Camargue around Saintes-Maries-de-la-Mer and the area around Agde are probably far enough, and the Atlantic coast is really much more our style. It was interesting how the driving near Marseille became much more urban-style aggressive and stupid. The laid-back style of the last couple of weeks had to be put on the shelf in favour of a more assertive approach. Why do big urban areas make people so unpleasant? I’ve obviously developed a phobia in relation to the fridge. I woke up this morning (relatively early at around 8.20am) to the sound of a vigorous gas burner. My first thought was that something dreadful had happened to the fridge, or perhaps less dramatically but slightly irritatingly, we were running out of gas. As my rational mind took over it was clearly neither of these things that had woken me. It sounded like a hot air balloon. I have a childlike fascination for hot air balloons – I guess in truth I have a childlike fascination for most things. I climbed out of bed, pulled on enough clothes to be arguably decent, and rushed outside barefoot with a camera to see what was going on. 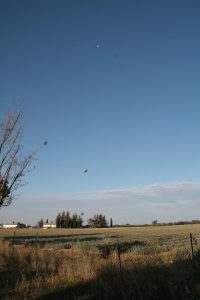 It turned out to be not just one hot air balloon but three of them, drifting along on the light warm morning breeze. The first had already gone past in the time it took me to get out of bed – it was now passing neighbouring houses at incredibly low altitude. The others were a little higher, but still very close to us. As they drifted away, we had the view of three balloons and the moon closely aligned in the south-western sky. The whole thing was a bit of a surreal reawakening in this idyllic location. After breakfast we walked the short distance into Puimoisson. 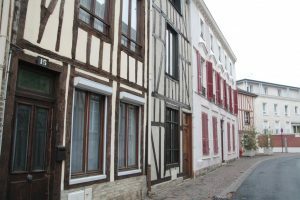 It’s a lovely example of the French big village/small town – far more local businesses than you would find in a similar village in England and not unreasonably, very south of France architecture. We saw at least three restaurants, a boulangerie, a boucherie and a coiffeur in our little Sunday walk. The boulangerie was open, and very friendly. We were lucky to buy the last baguette. There were four old men in deep and animated conversation outside the cafe. 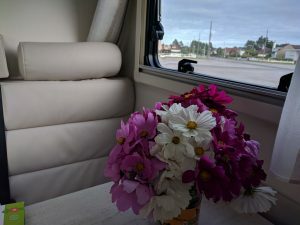 After yesterday’s day of travel, we were able to be very unpressured and laid back – the rest of the morning was sitting in the sun admiring the view, and thinking about adventures for the afternoon. It was time to take the mountain bike out. I studied the map and there seemed to be a good chance of finding some off-road action. I had Lac de Sainte Croix as a very hard to miss target. So after lunch I was on the bike, pleased to see that after two repairs air was finally staying in the front tyre – I was hoping it would stay that way. 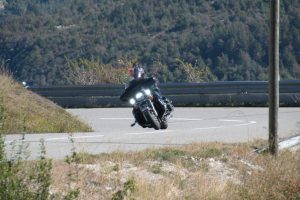 The first part of the trip was rather easy – high speed downhill. I was reminding myself that for every metre we descended I would have to climb another metre, much much more slowly. That’s the nature of cycling in hilly areas – you spend far more time going uphill than down. It seems terribly unfair, but c’est la vie. 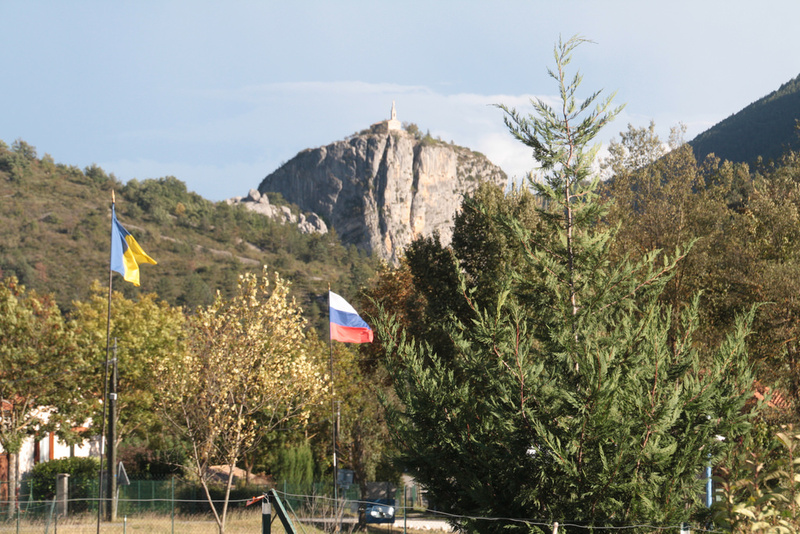 I also kept reminding myself that we were in the Alpes-de-Haute-Provence and I am more accustomed to Suffolk. After my rapid descent I turned off-road and attempted to navigate roughly southwards to the lake. It became apparent that there was an embarrassment of opportunity for off-road cycling, with a consequential navigational challenge, but I enjoyed some very pleasant tracks, steep and rough enough that I had to walk up some of the hills, but not so frightening that I chickened out of the descents. 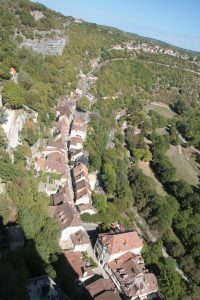 I found the village of Roumoules, and was pleased that I was conducting nothing larger than a bicycle – lots of narrow streets and a wonderful feeling of travelling back in time. As I came out of the village there were some signs for paths going roughly in the direction I was seeking. They’re not so up-tight in France about the distinction between a footpath and a cycle-path, so I happily followed the track until I came to a dead-end outside a house where the family were enjoying an extended lunch in the garden. A lady insisted on coming down to talk to me, and then beckoned her daughter to come and give me some navigational advice – lovely kind welcoming people. 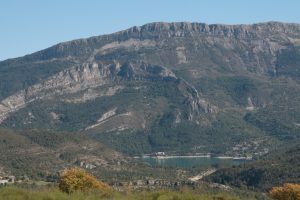 Partly with their help, and partly by ignoring it, I was able to find the right track (the way-marking had missed a vital right fork), and continue off-road to the outskirts of Sainte-Croix-de-Verdon. 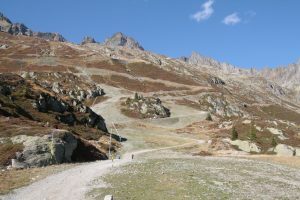 The road down to the lake was another exhilarating descent with hairpins to test the disc brakes on the bike. By now I’d been going a long time and I was conscious of the need to be sensible, and take account of the time of day, the fact that the weather forecast was for rain later, and the ever present thought of the consequences of every metre of descent – so I resisted the temptation to go right down to the lake. I had some magnificent views from on high, and turned around after taking a look at the motorhome aire. 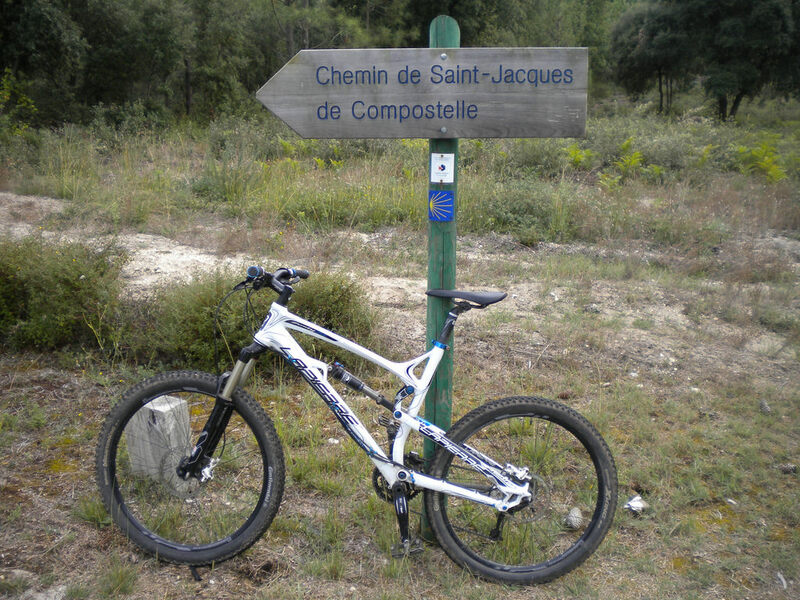 It turns out that I was being unduly conservative – climbing out of Sainte-Croix was indeed a bit of a grind, but much easier than I had expected. I took a more road-based route home. Travelling on-road is much quicker than on tracks, and there was very little traffic, so it was pleasant enough. The navigation is also rather more determinate – at 75 minutes the trip back was an hour quicker than out-bound. All the way back I was thinking about that long fast descent at the start of my ride. How was the climb back up going to feel after three hours in the saddle? It turns out that, as with the climb out of Sainte-Croix, just finding a comfortable gear and keeping the pedals turning got me to the top surprisingly comfortably. All in all it was a very enjoyable ride – lovely views, some interesting off-road parts, and some education on hill-climbing on a bicycle. And then we had a very pleasant white wine with dinner. The site at Puimoisson was indeed excellent – but not perfect. Given the price of the site it’s perfectly reasonable that there is a charge of €1.00 for water (but since it’s paid by card, how much will VISA take in the whole transaction). This supposedly gives 100 litres or 9 minutes of water. I didn’t time the water supply, but it certainly didn’t amount to 100 litres. That’s not a problem as things have turned out, but it had been my intention to have a full tank to keep our options open for the next few days. 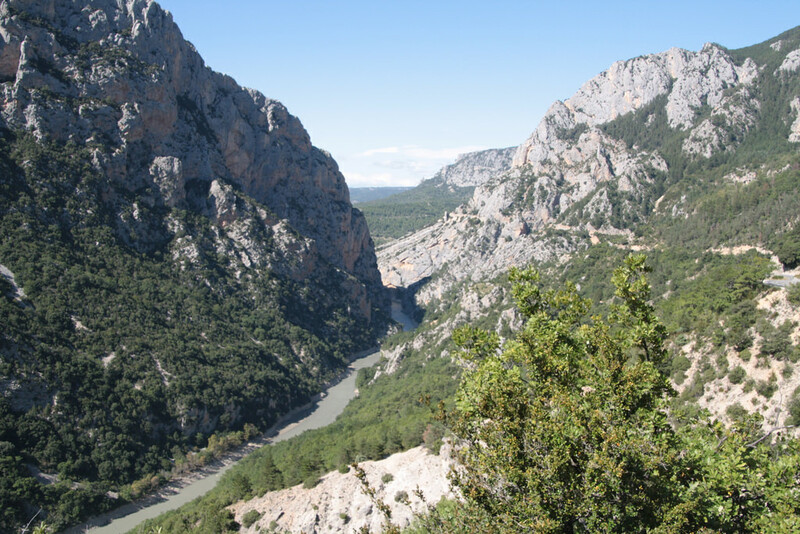 Today’s travel was short in distance, but took quite a time, since we were travelling the twisting and narrow roads of the Verdon Gorge, with great panoramic views (mostly to the right), initially of Lac de Sainte Croix, my bicycle destination of yesterday, and later the Verdon Gorge itself. 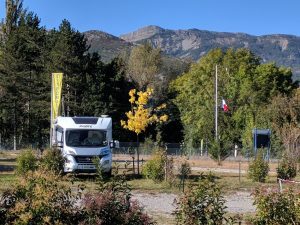 Our stopping point was, as planned, at Castellane, where there is a spacious if slightly “characterful” motorhome aire outside the Museum of the Résistance. The Museum itself is pretty characterful too – the guy in charge was a little odd, and certainly not as friendly as his dog, but for me the Museum was firstly a testament to the stupidity and waste of war, but also a reminder that for people in France the experience was very different from that in the UK. They had an invading force, with Germans in charge of day-to-day life. The museum had a huge number of artefacts in an idiosyncratic collection, much of it with a local connection, displayed in a warehouse-like building under what might be described as intimate lighting – or perhaps near darkness. Oddly, this aire is the first we have been on that has WiFi, and it’s free. It’s very slow, but no worse than that which the UK camping clubs charge huge amounts for. 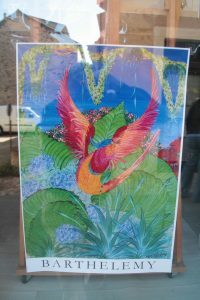 It’s certainly an interesting place to visit, within easy walking distance of the town and even closer to a supermarket. I rounded off the evening with a walk into town to top up on cash. 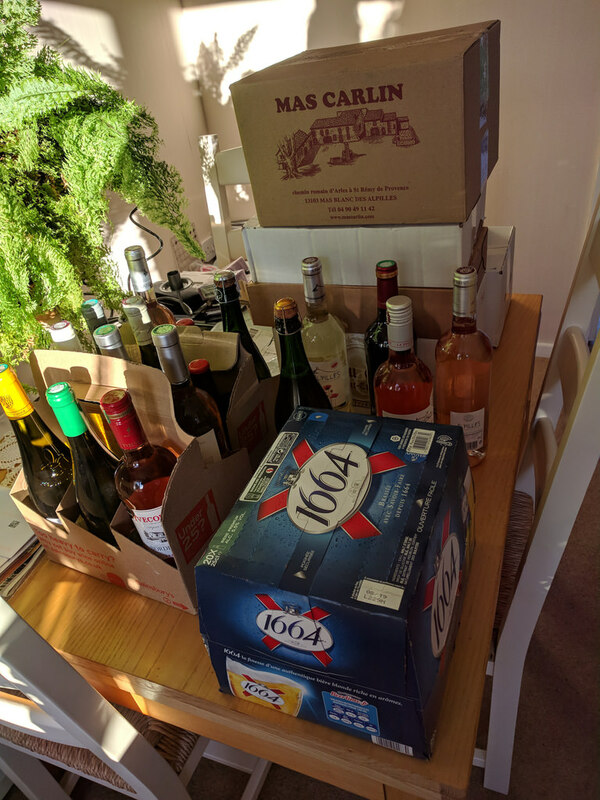 So far nearly all our payments have been by card, but we need cash for some of the smaller establishments – a chunk of real money went on wine and jam a few days ago. Looks as though it will be cold tonight – Mrs D is not keen on that. I guess an altitude of around 750 metres doesn’t help. Perhaps I should have taken a pitch with electricity – temperature didn’t seem to be a big issue when we checked in. It was pretty chilly last night, but we survived, as did the battery. After finishing all my messing about with the blog and pictures on the PC, and the excitement of being connected to WiFi for the first time since leaving home, I took a glance at the battery voltages. The leisure battery was less than 12V on load. When I turned off the PC and the inverter powering it, the voltage rose to 12V. I had a vision of a freezing night with no means to run the heater, but as so often happens with my visions of doom, it all worked out OK. In fact by the time we woke up at 10:30 (yes, really! ), the sun was shining, the solar panels had taken the battery voltage back to something reasonable and no-one had died of exposure overnight. 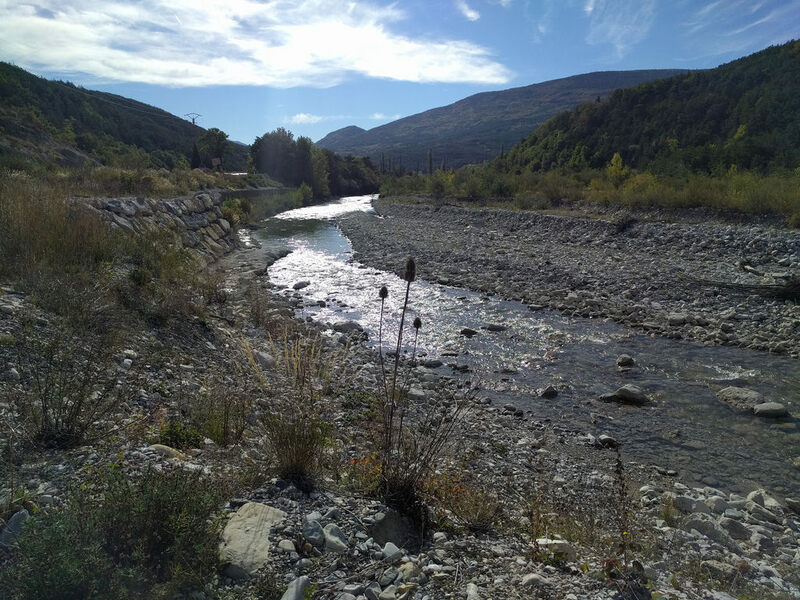 A side-effect of a journey with no overall strategy is that you go to places with no real idea of what comes next, and so it was with being in Castellane – it was a good place to stop after doing the Grand Canyon of the Verdon, but where now? 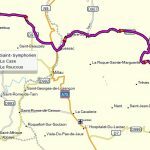 I had noticed various signs mentioning the Route Napoléan and 1815. It seems that we had spent the night right beside it, so the decision was made for us – follow the Route. 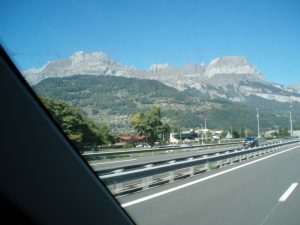 It turned out to be a good drive, with roads a little more suited to the motorhome than those we had been on for the last few days – plenty of lovely mountain scenery, but a more relaxing drive. 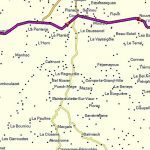 In fact I had put Chamonix into the GPS as the destination, not because I expected to get there today, but it was a simple way of navigating Route Napoléan (it’s one of the few ways north from where we were). It looks as though Chamonix is becoming our de-facto destination in the next day or so. That will be a break with the “go to new places” ethos, but big white mountains are so exciting. There are not a lot of stopping places around here, and we are currently wild camping on a little track between the river and the road. As always in these places, there’s a bit of anxiety about whether we’ll have any problems with wild camping. It seems OK – but a vehicle just swept past us, and with the blinds pulled we have no idea what it was or where it went. If we’re never seen again, this is perhaps a clue to our disappearance. The forecast is for another cold night! So we weren’t knocked unconscious and robbed on a lonely river bank in the middle of nowhere. It turns out that the vehicle that came in after dark was just another motorhome – I guess they’ve also been using the park4night app to find places to stop. It is a very useful tool for this unplanned wandering style of holiday, but like all tools has to be used with some caution. Some of the places people have suggested might be good for a VW camper, but are just not sensible for a motorhome that’s the best part of 2.4m (that’s 8 feet with a proper ruler) in width. Combine that with the risk of Samantha in the GPS picking an imaginative route if left to her own devices, and you have a recipe for some fun or embarrassment. The last part of today was one of those times. 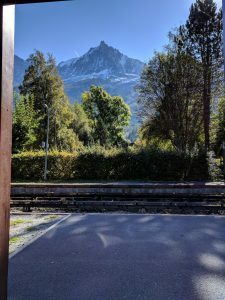 I had chosen what looked to be a pleasant place to spend the night near Chamonix – as we got close to the destination, on already narrow roads, Samantha suggested taking an almost invisibly narrow road to the left – that’s the difficult side when you’re in France. I declined that, so she suggested the next left. Fortunately Mrs D had noticed the no left turn sign, so we refused again. 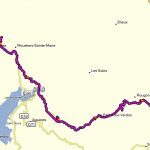 I decided to continue towards Chamonix to see if we got a more sensible route starting from there (that sounds rather like the old joke about asking an Irishman the way, and his reply being that he wouldn’t start from here – I know, it’s the way I tell ‘em). The new attempt at a route very quickly got us on to silly roads, so it was time for a fallback solution. We’ve gone to a real campsite – the sort with electricity, toilets and WiFi (not sure about the order of priorities on those). 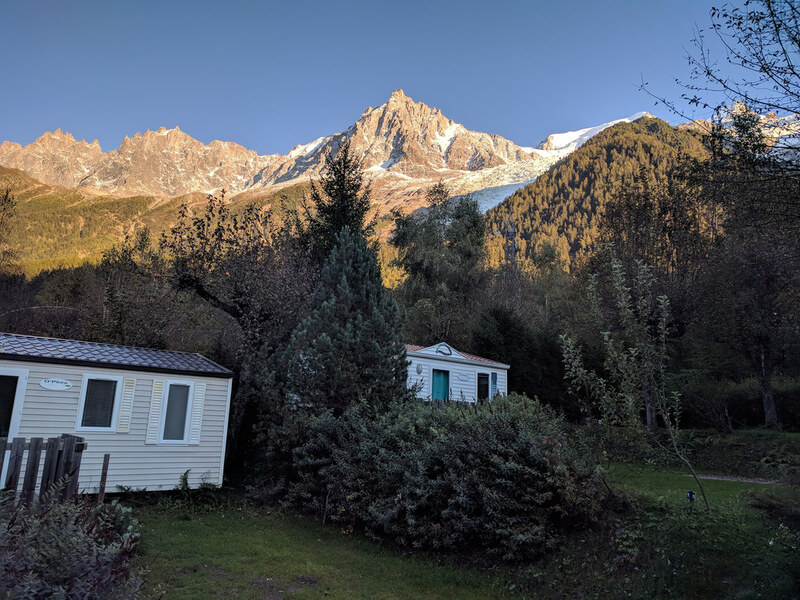 Not only that, but Camping les 2 Glaciers gives us a great view of Mont Blanc, with the Aiguille du Midi right in front of us. We had been hoping to go up to 3,842m as we had a few years ago. It’s our anniversary tomorrow, and it would have been rather romantic to go up in the cable car to celebrate – but as far as I can tell from the internet, the cable car is broken, and most of the other lifts and trains are shut down now for maintenance between the summer season and the ski season. So we’ll just have to use our free bus tickets to go into town instead – last of the big spenders. The journey here was a mix of twisting mountain roads and some big flat fast roads in the valleys. It was fascinating seeing the scenery transforming into the big mountains that we’re in now, and amazing just how big and flat are the valleys. Nature is big round here. As so often seems to happen, there was a shortage of decent lunch stopping points at the appropriate time but, as we have tended to do over the years, we enjoyed the lack of traffic as the locals took their lunch break seriously. Fortunately we happened upon a pleasant lakeside picnic spot before the onset of starvation, and the place had the added benefit that we could empty and replenish the motorhome to give us flexibility over the next few days since as far as I can see Chamonix doesn’t have much in the way of motorhome service points. A result! Camping les Deux Glaciers is a good site – I’ve already talked about its unmatchable view, but overall it’s a nice place to be. It’s all a bit snug, so it could be challenging for a large motorhome or caravan, but so would the roads to get here. And how about that choice of 3, 6 or 10 amp mains hook-ups – decisions, decisions! A non-driving day today. Even more unusually it was a lock-the-van-up-and-go-out-for-the-whole-day day. 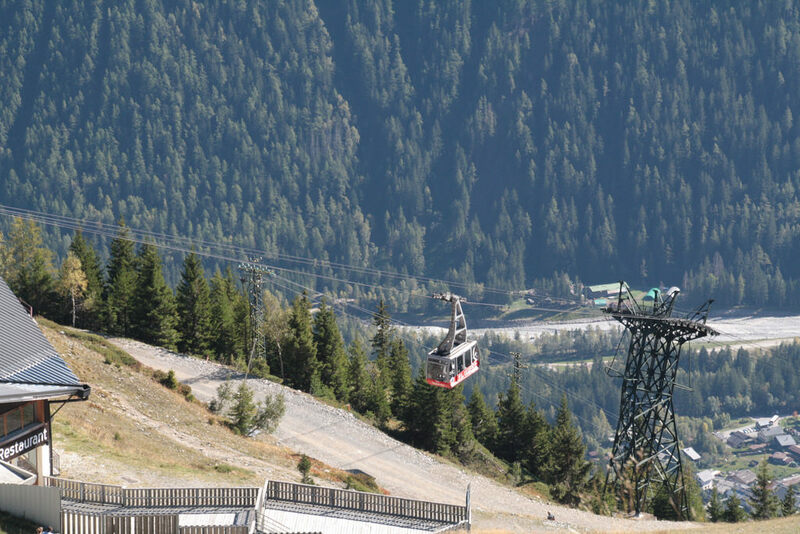 And whilst we weren’t able to get up to the top of the Aiguille du Midi, we were able to take the train (complete with replacement bus service) to the Flégère cable car from Les Praz to get another perspective. It was a day that showed it’s not how high you get that matters but how much you enjoy it. 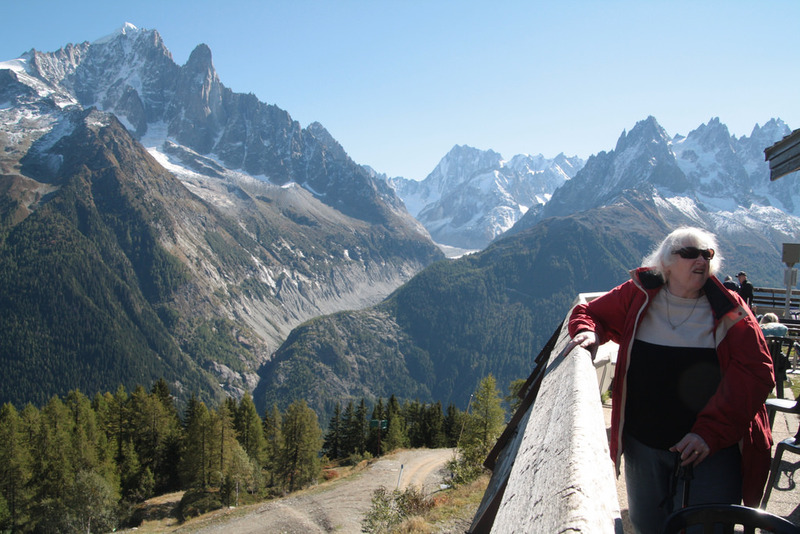 Flégère certainly can’t match the spectacle of Aiguille du Midi, but it’s a lovely laid-back place to just sit and look at the scenery, take a walk or indeed as some people were, a mountain bike ride. It’s still high and steep, but it’s accessible to normal humans. Lunch was a baguette and a beer (Coke for Mrs D), finished off with the mandatory patisserie. 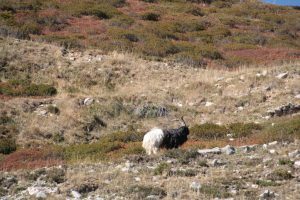 After looking at the views around the cable car station I left a couple of layers of clothes with Mrs D and set off up one of the uphill trails, not stopping until I caught up with a mountain goat. I could really enjoy some serious walking around here. The hills are steep enough to make walking very energetic, but not so difficult that you can’t get anywhere – in fact it’s amazing how quickly you can gain height just walking. After coming back down on the cable car, and having a chat with the attendant, who would normally have been working at the Aiguille du Midi if it were not broken, we caught the bus back to Chamonix Central, which didn’t at first sight seem very central at all. The trick was to walk just 50 yards or so in the right direction, and having found the town the next trick was to pick a place to eat. After pondering the options, we went for the middle ground between a pizza place and a Michelin rated restaurant. Le National served up enormous helpings of tasty food with a relaxed and friendly style – it has mixed reviews, but we liked it. The whole atmosphere was captivating in that part of town, with a good quality busker and general bustle of people passing along the traffic-free street. So the wedding anniversary dinner turned out to be a success – thank goodness. And then the train brought us back without any worries about the bottle of wine we consumed. 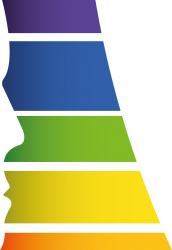 It’s amazing how the efficient and free (for visitors to local hotels and campsites) transport system enhanced the pleasure of our visit – someone in control sees the value of long-term investment in goodwill, rather than screwing the visitor for every Euro. What we didn’t spend on bus and train fares we more than paid back into local businesses due to the ease and pleasure of getting about. It’s probably all a little different at the height of the skiing season! Sadly it’s about time now for us to move into heading back home mode. Yes, indeed, we accidentally visited another country, and what’s more, it’s not even in the EU. When we’ve been to Chamonix in the past I’ve always made a point of finding a route home that avoided going into Switzerland. It’s not that I’ve got anything against the Swiss as such, but their policy of making you buy a vignette before you can use the motorways is not only complicated but rather unfair, because you have to buy a vignette valid for a whole calendar year just to be there for two hours. So where is it we’re heading? So, as I said I’ve always bypassed Switzerland for this journey – until today. 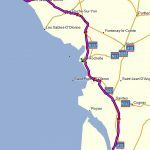 This time I’d been rather lazy and simply told Samantha that I wanted to go to Calais, so she sorted out a route. It took her a quite a while, but once she was ready we set off. All seemed to be going well until there was a sign telling us we were approaching the douanes. Almost in the time it takes me to type this (I’m very slow) we were in Geneva. 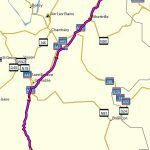 The good news is that when travelling in France (and now Switzerland) I ask Samantha to avoid tolls, and in Switzerland it seems she treated motorways as toll roads. Of course, we still have the mobile phone companies to contend with. While roaming costs nothing (at the moment) in the EU, Switzerland isn’t in the EU. My phone had roaming switched on for France, and it wasn’t until Mrs D received an SMS on her phone telling her about the data charges that I realised the implications. Did my phone use any data before I switched it off? We shall see. 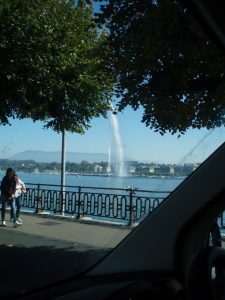 It was quite scenic if a little inhospitable travelling around Lake Geneva, complete with its big fountain. I was rather in a state of shock trying to learn a whole new set of road signs and speed limits. One important thing I had learnt when we visited Switzerland intentionally a few years ago is that unlike everywhere else their motorway signs are green and the signs for ordinary roads are blue. At least in this part of Switzerland it’s all in French, so I sort of knew what was going on – mostly road-works it seems. It would have been nice to have had a chance to stop and look but not surprisingly it was very motorhome unfriendly. We eventually emerged from the urban sprawl and the road-works and found a car-park in a village for a very late lunch, and a check on what Samantha intended next. 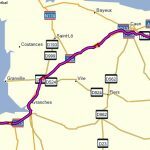 I was pleased to see that Samantha was going to get us on a road to France, still avoiding motorways – even better it looked a pretty interesting road. 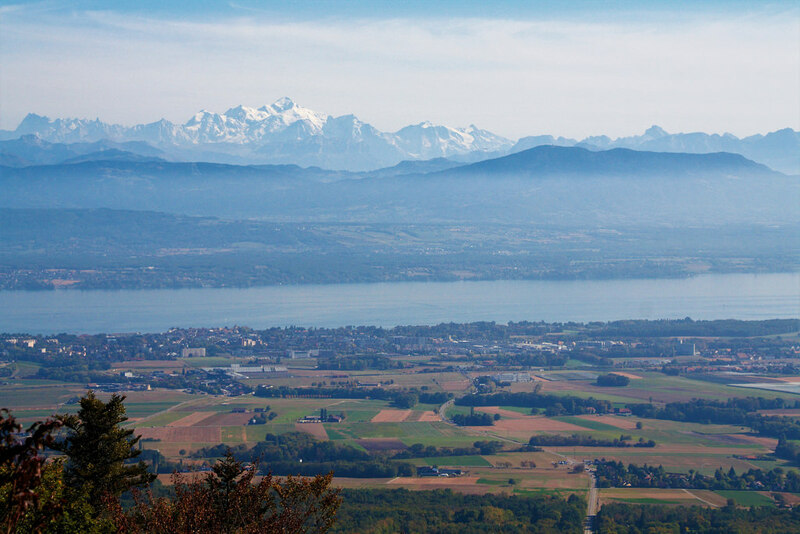 And so it turned out, up and over the Côte de Nyon allowing a stop at a viewpoint with an impressive panorama. So the little accidental excursion showed that it is possible to avoid Swiss motorways, and that with some rather better planning this could be an interesting area to explore. But as it was, I was quite happy when we came back over the border into France, a country I understand so much better. We continued on our Calais-bound route with no overnight target in mind until around 5.00pm, at which point we stopped to consider the options. Park4night had what sounded to be viable stopping places, but I then checked the France Passion guide (this still has to be done the old-fashioned way, on paper) and saw that we were within 30 minutes of a promising farm site. 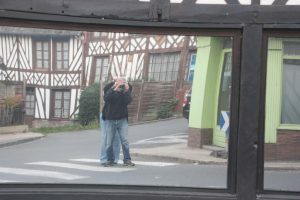 Some misleading instructions from Samantha combined with some cunningly confusing road junction design led us a little astray, and I recognised that we were heading towards another France Passion location. So, by a series of half decisions and happy accidents, here we are now installed alongside some chickens outside a winery in a pretty little village called Pupillin. We had a very peaceful night in Pupillin, and before we left took advantage of the fact that our host is a wine-grower. It was very early to be tasting wine, but it had to be done, and we added some white wine to the stock of red acquired in our travels. Before properly entering travel mode we took a detour of a few miles to see the local viewpoint of Cirque du Fer à Cheval. Annoyingly Mrs D has just told me that fer à cheval must be a horse shoe, and she’s right – I really prefer smugly telling her things like that. The view was indeed impressive, but after Mont Blanc everything else seems very tame. The toilet cassette emptying point allowed the lid to be opened without touching unpleasant bits, had a hook to hold the lid open and the opening was a good shape, size and height to empty the cassette without collateral damage to clothing or hands – nice! …and it was free too. We’re on our way home, but not in a rush – just enjoying travelling through interesting parts of France without any marathon driving sessions. 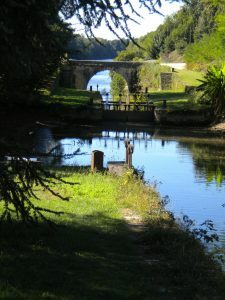 Just before 5pm we stopped to find a sensible place for our night halt, and we are now at the aire in Joinville, with a little grass picnic area between us and the canal. Very nice, but the motorhome service facilities are nowhere near as good as those we used at lunchtime, so it’s handy we don’t need them. We walked the short distance into Joinville, a little town with that slightly world-weary French feel. We were tempted by dinner at the restaurant, but decided against it. Our bodies are still pretty stocked up after dinner in Chamonix a couple of days ago. 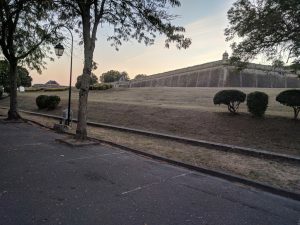 So there we were, sat in a car-park right outside a campsite in le Quesnoy just after 5.00pm trying to decide on the venue for our overnight stop. After a while I had to accept that, while it was a little obvious and unadventurous, just staying at the site 20 yards away did make sense. 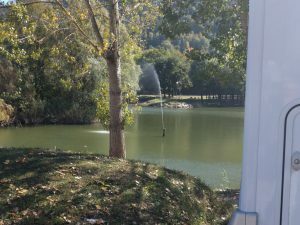 Camping du Lac Vauban is an OK place for a motorhome. 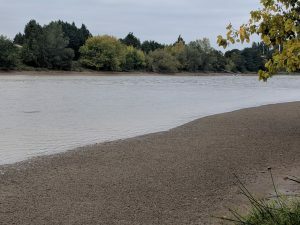 There’s a service point (although I’d be a bit careful about the fresh water connection – the arrangements are not as meticulous as I would choose), and the pitches are spacious, with hard standing, on a very slight slope. 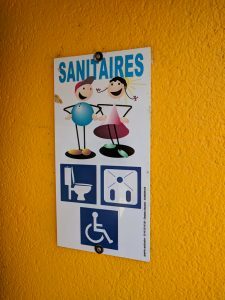 At this time of the season the sanitaires smell like – well, like French sanitaires, so we will probably pass on that, and use our own facilities. We took a little walk from the site. There’s a pleasure lake just a few yards away, and a cafe with a tea dance in progress. The ramparts of le Quesnoy are also just alongside. A lot of man-hours went into their building. 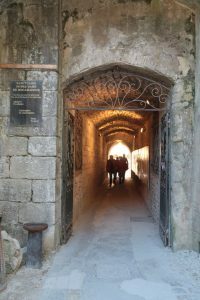 Inside the walls is a proper town, not just a couple of tourist restaurants as with some well preserved fortified towns. Sunday in France is both a problem and an opportunity. 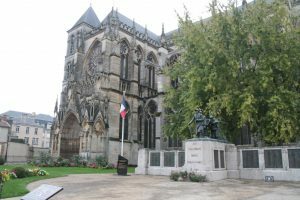 They take their day of rest seriously, and so it proved when we visited Châlons-en-Champagne (or is it Châlons-sur-Marne – the town seems to have an identity crisis). We had decided last night that it could be interesting to stop off and have a look around, taking advantage of Sunday to secure parking in town. We found the car-park I had earmarked online, but it was certainly not a good place to try to park a motorhome, but the circuits of town undertaken to overcome a closed road had revealed some excellent on-street parking, so we were to walk a loop around the main attractions. It was all very quiet – there are some very cute timber-framed buildings, but as far as we could tell, even the cathedral was closed. The street on which we were parked was so quiet we just ate lunch there – a couple of cyclists and a skateboarder went past, and that was about it. 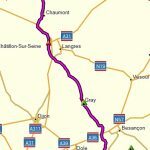 So that, for us, was Châlons – nice enough, but nothing to write home about on a Sunday, and any other day we probably wouldn’t be able to get the motorhome in there. And so we continued on the homeward trek – huge fields and mostly flat countryside. Samantha the GPS lady chose a route with some major roads and some more obscure smaller roads. The major roads were quiet, with virtually no trucks on a Sunday, and the smaller roads were mostly empty. For us, whichever way we do it, northern France is somewhere to drive through. One more whole day here before we get the ferry – and then that feeling of how crowded and small everything seems in the UK. Just a simple travel day today. We woke up remarkably late – it was after 10am for me. It’s just as well we hadn’t planned some monster driving stint to get back. As it was we had time for both of us to shower in the van, and to do a last fill and empty of tanks. I found a stand-pipe in the camping field that looked much more wholesome than the official motorhome fill-up point, so I carted a couple of jerry cans of water and pumped them into the tank, making it brimming full. We had obviously been economical with water for the last couple of days. We used the service point to empty grey water and toilet – probably not necessary to get us home, but at the very least it saves a bit of weight. 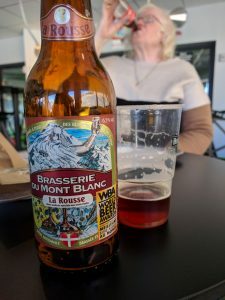 And weight saving is probably useful, because the mandatory visit to Carrefour at Cité Europe near the Channel Tunnel terminal allowed us to top up on wine, beer and cider. Unlike our last trip to France, I had taken account of the fact that Carrefour is not open on Sunday afternoons, and arranged a ferry for Tuesday. Magically with this van, we got all our purchases into the garage rather than cluttering the floor for the last night in France, which was the norm with the previous van. It’s probably not doing much for the weight distribution, but according to the official figures we should have plenty of payload. 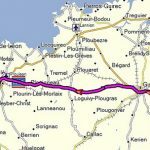 The journey was mostly dual carriageway – nothing exceptional and no stops on the way apart from lunch which was at a service area near Dunkerque. It was all very odd. The lorry parking area has been closed (presumably to stop migrants boarding trucks for their luxury trip to Blighty), but the parking for smaller vehicles is open, and when we visited occupied mostly by small Polish trucks (several new ones popped in while we were there) and a prominently positioned CRS (French riot police) minibus with a couple of their guys hanging around. They didn’t look like the sort of people you argue with. I couldn’t help thinking we’d dropped into someone else’s argument, and didn’t understand what was going on. 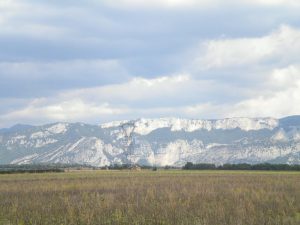 After lunch it was just a short run to the shopping expedition, and then we decided for our last night to visit a campsite in Escalles, very near to Cap Blanc Nez, with nice view over the channel. We’ve been to a few times before but it wasn’t to be this year as we were thwarted by roadworks. 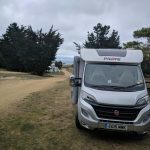 We were trying to work out the best solution to this when we happened upon a free motorhome aire in Wissant – problem solved. 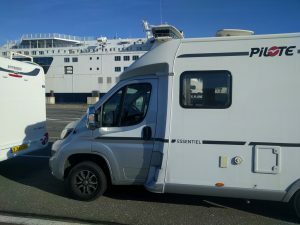 After we had parked up a French motorhome came in and decided to park very close, but we can still open the door – just! And so to home. 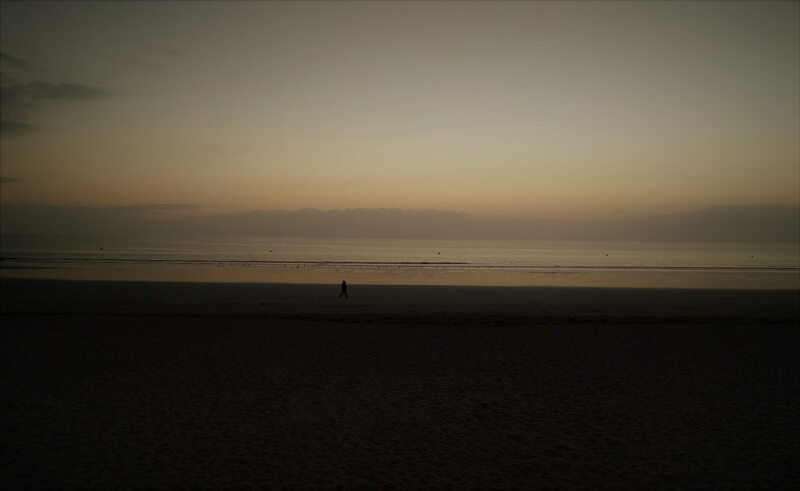 We spent a peaceful night at Wissant. 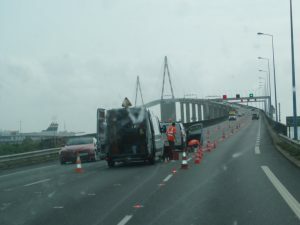 It proved to be a good staging point for the Calais ferry – far enough from the Calais itself to avoid any problems, but a very simple drive to the terminal. As on the trip out, our timing meant that we got on to an earlier ferry than booked, which is handy. As ever the port procedures were a little mysterious as we were handed pieces of paper that contained incorrect information and weren’t used at all, but they were clearly expecting us – the only documents we had to show were our passports. 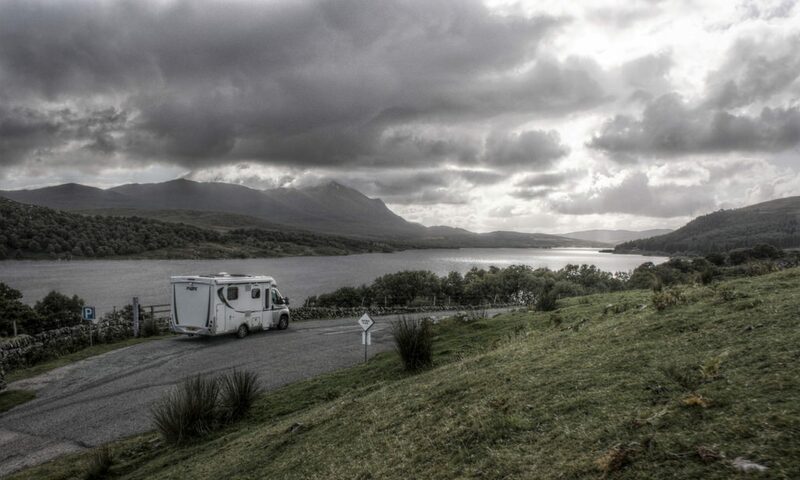 The UK Border Force seems to have become the UK Boarder Force – we had the pleasure of one of their men entering the camper and searching for that secret compartment in which we might have hidden illegal entrants, and then inspecting the garage. I can’t help thinking they’re rather barking up the wrong tree here – if I were setting up a people trafficking company I would choose HGVs or boats as the vehicle, not 6.5 metre motorhomes. The ferry was far from full, despite a couple of coaches of very loud Dutch school kids. The restaurant was virtually empty at around noon but that is perhaps hardly surprising, since oddly the only meal on offer was breakfast – full English of course! On arrival at Dover I had the usual confusion on finding the right road out – as I was telling Samantha the GPS that I favoured the M20 over her choice of the M2 I turned left at the roundabout on to the route to the M2. Perhaps she was right after all. The journey was trouble-free but the traffic, after our time in France, was a real culture shock. We live in a small and crowded country. It wasn’t long before we were parked outside our rather chilly house and normal life could resume.